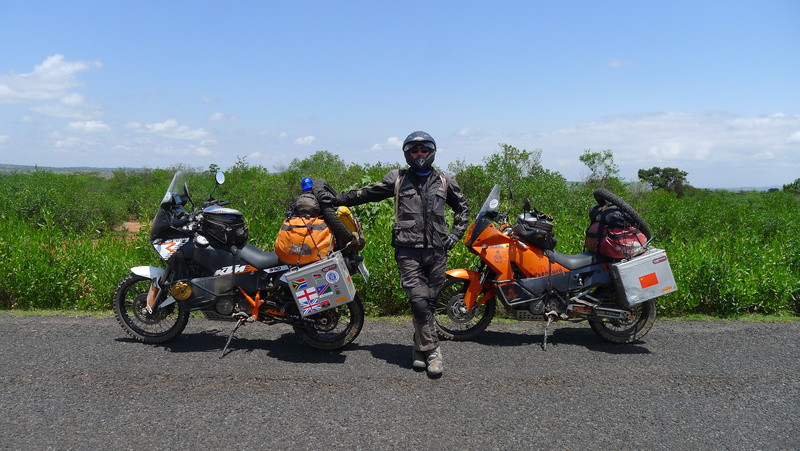 Paul and Marja from Holland who accompanied us along the tough roads in north Kenya to Ethiopia and kindly carried extra petrol, water and our panniers for us in their van, The Wobbel. Thank you both so much. 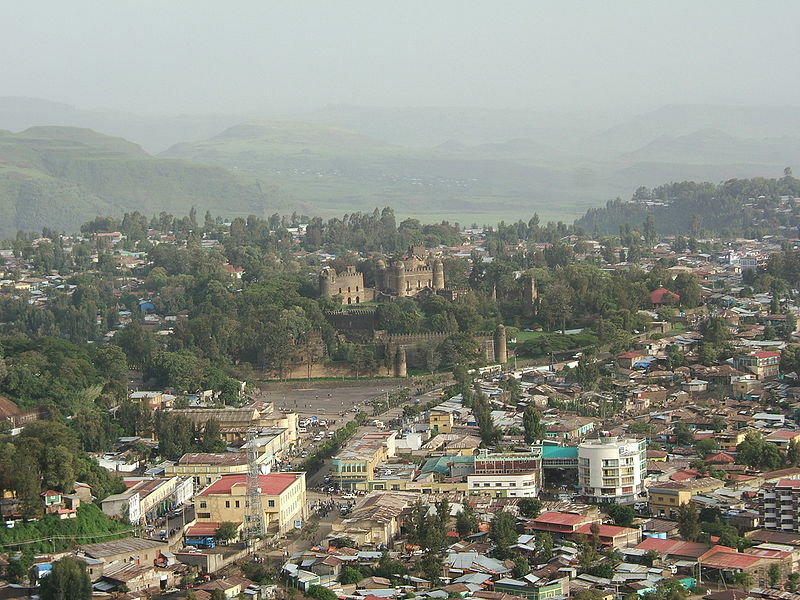 Ethiopia is a large landlocked and very mountainous north eastern African country with a population of about 82 million people. 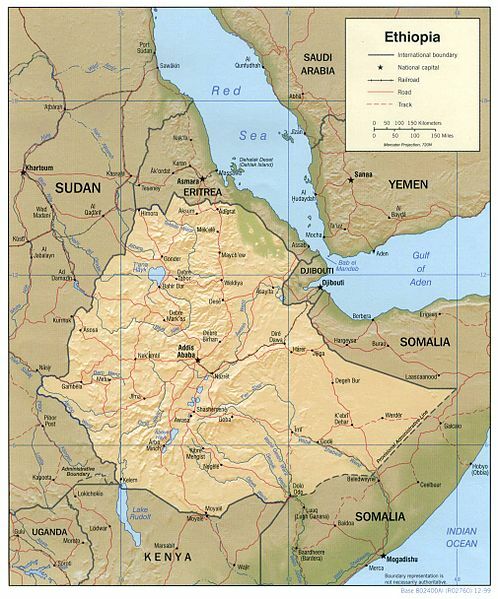 It has an amazing history and is surrounded by what I would describe as some of the worlds most hostile, or at least, volatile places… Eritrea, Djibouti, north Kenya, North and South Sudan, and of course, Somalia. 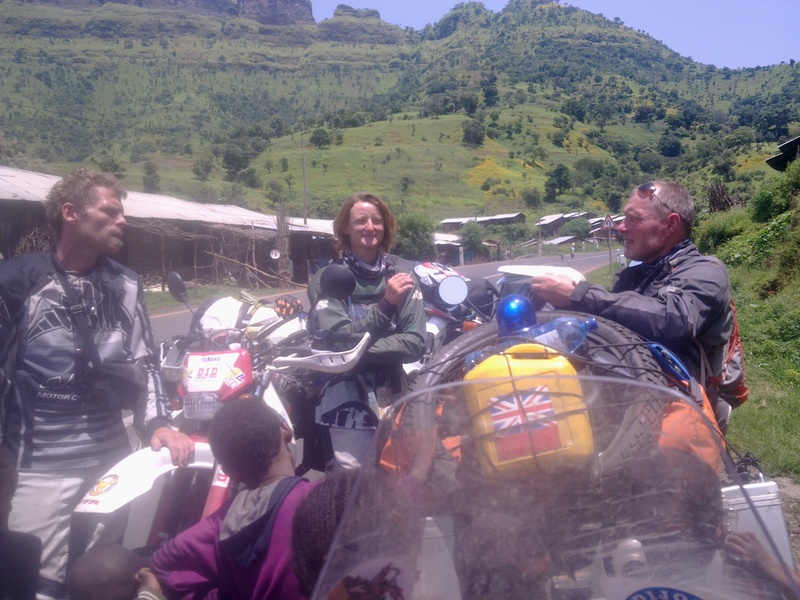 Reaching Ethiopia brought both of us a huge sense of relief and a well deserved break from tough riding conditions. We had heard so much about Shiftas (armed bandits), lack of fuel and water and truly bad road conditions in north Kenya. 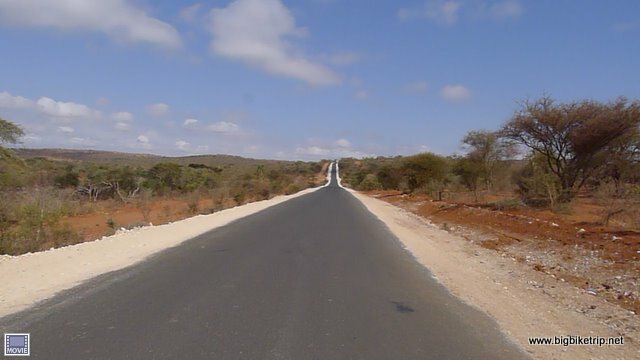 Indeed the road to Moyale had been tough, no doubt about that, but it was behind us, beaten by Fanny who had less than eight months motorcycling experience and her lao touzi (me). We did not know at the time that some European tourists and aid workers had been kidnapped by Somalis just a short distance away on the east coast island of Lamu and also at the nearby refugee camp in Dadaab. Whilst completing the usual formalities at the Kenyan/Ethiopian border I noticed that the local people’s appearance had changed dramatically from the rest of Africa. Taller, slimmer, lighter skin tone, aquiline features and wavy longer hair. The language had also changed from Swahili to Amharic and we would be asked often if we could speak it and would receive blunt admonishments because we could not. I did picked up a very few words, but Fanny launched herself enthusiastically into learning the basics and used them as much as possible. Sadly, my brain is too old and too full of Chinese words and characters to remember Amharic, to my ear a complicated sounding language and in 2011, as pointless to learn as Cantonese or Welsh… except of course if you are actually live in Ethiopia, Wales or Hong Kong. Later I would make more effort and pick up some Arabic… a much more widely used language in north Africa and the middle east. There seemed to be a lot of people everywhere and they were noticeably noisier and more confrontational than the other people we had met in Africa. It was not long before we encountered our first onslaught of begging and ‘YOU YOU YOU…MONEY MONEY MONEY’. Hands outstretched and pleading faces. Fanny and I found out at the very scruffy Ethiopian immigration department that we only had two weeks left on our visas which was a bit of a shock and a disappointment. Apparently the one month long visas we had been granted had already started from the date of issue in Beijing and London where we had to send our passports. Our attempts to extend at the border were fruitless. 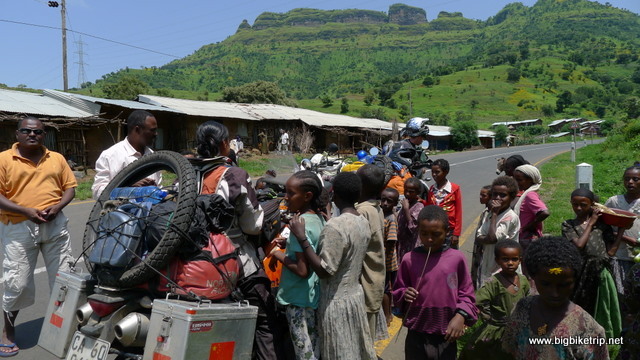 To make extension even more troublesome the customs documents for our bikes and carnets were also stamped for the same duration making our stay in Ethiopian short and due to its size, rushed. We also had a long wait with customs as they painstakingly and slowly filled out reams of paperwork and translated everything phonetically into Amharic. Its their country of course, we were guests and they can do what they like, but it was annoying and to my mind, illogical and counter productive. Anyway!! 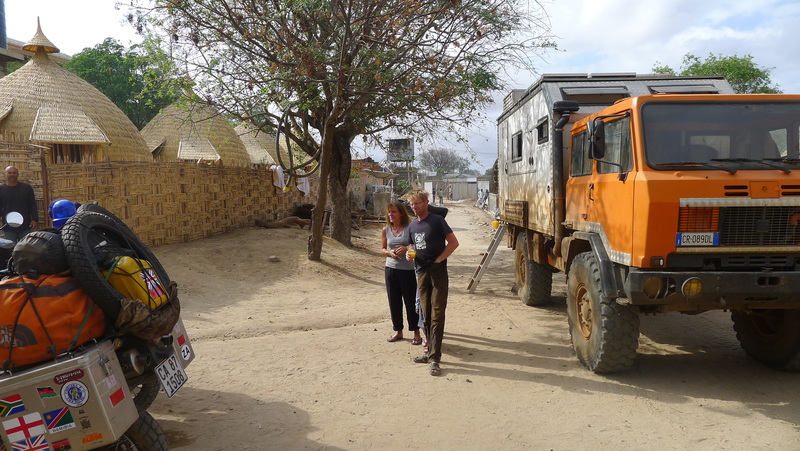 Paul and Marja and another Umigog 4×4 truck that stayed at the camp site in Moyale. 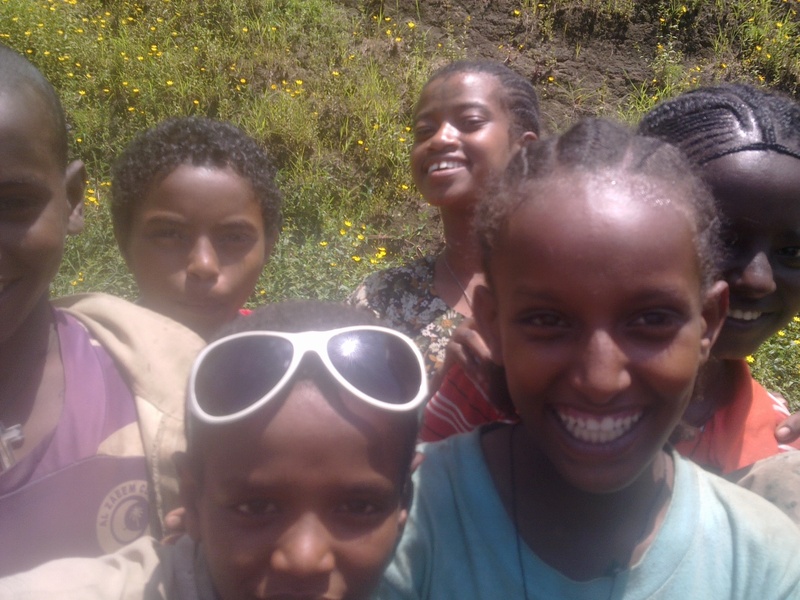 Ethiopian kids .. that girl has exactly the same sunglasses as Fanny … hang on… wait? 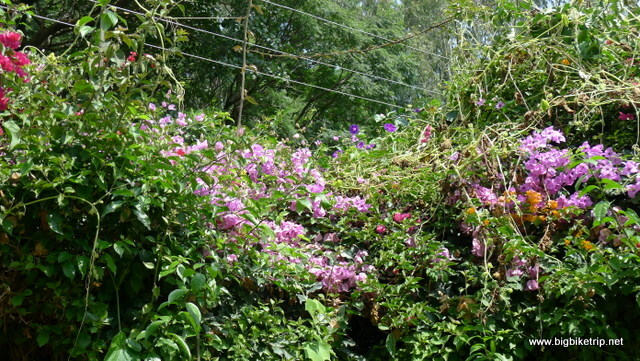 The rains had just finished and the countryside was lush and resplendent with yellow and white flowers…. I had to work out a route that would allow us to see as much of Ethiopia as possible and yet exit into Sudan before our visas ran out. This exit would have to be at the optimal time to start our short two week visa period for Sudan, register in Khartoum within three days, and at the same time be able to catch the once a week (Wednesday) ferry from Wadi Halfa in Sudan up the Nile to Aswan in Egypt. There is actually a new road that stretches across the long border between Sudan and Egypt, several in fact, but they are closed on both sides by respective military powers for security and commercial reasons and so the only border crossing is by “Night Boat up the River Nile”. We would actually have to reach the remote border town of Wadi Halfa early enough to complete all the paperwork, load bikes onto a separate barge that would leave a day earlier, but arrive at the same time as our ferry. Tight schedules and long rides. What could go wrong? Breaking down in the middle of the Nubian desert, perhaps? Riding through South Sudan was not an option at this time because of the very recent separation from the north, administrative chaos and continuing skirmishes along the new border. Extending our visas would be tricky too as the only place to do it would be in Addis Ababa and the country was about to launch into a period of national holidays for the 2004 New Year as Ethiopia follows the Coptic calendar… which is about eight years behind the Gregorian calendar that most of the world use. I was rather annoyed at this… not for using a different calendar… but for inflexible and unfriendly policies. The UK and other countries have been ploughing money and aid into this dependent country for years and I thought, rightly or probably wrongly, that they should be a damn sight more grateful and pleasing. As we were waiting at Ethiopian immigration and customs for various forms to be laboriously filled out I observed a huge man, at least 1.9 meters tall throwing himself around violently in front of cars and shouting at us. He was either mentally handicapped or had been waiting in queue for the wretched forms to be filled out and had seriously lost the plot. Who could blame him. However, its always distressing to see someone behave like this, or so Fanny tells me when I act up. Strangely, everyone seemed to be ignoring him, even as he launched himself onto the bonnet of a car and rolled about yelling and shouting. 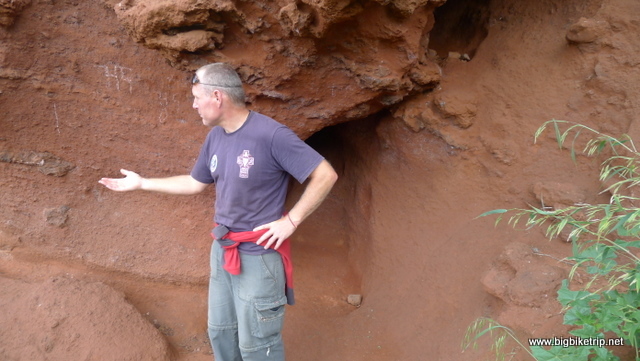 There would be many more very odd and slightly annoying encounters from the locals to come. 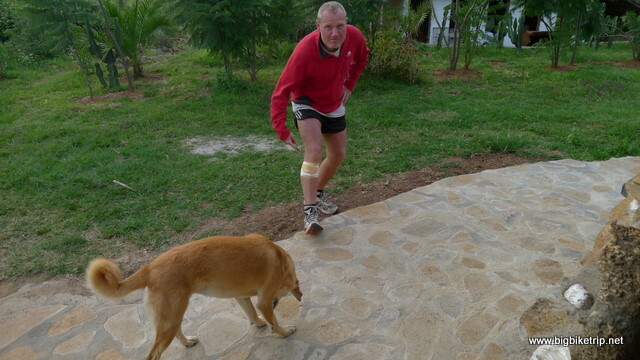 We camped at a place recommended by a sort of “fixer” person who latched onto Paul, Marja (our Dutch companions who carried our fuel and panniers), Fanny and myself on the Kenyan side. 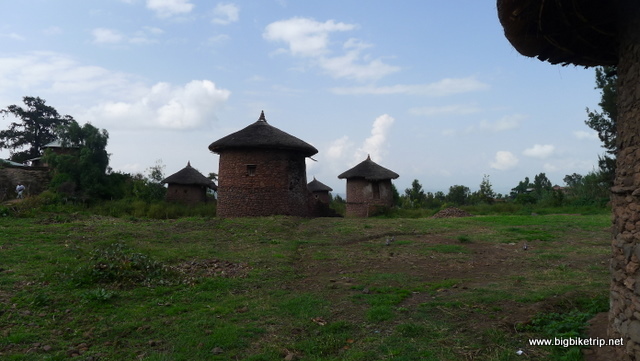 Actually the lodge, which had strange conical shaped straw huts, was the only place we could stay at and was fairly cheap, as indeed most of Ethiopia proved to be. Paul and Marja had their Mercedes truck, “The Wobbel”, to sleep in as usual and so when we arrived they didn’t hang about finding a bar and getting a beer. I was still in a rather grumpy mood from the shenanigans and time wasting at the border and decided I would immerse myself in maintenance activity and sort out the bikes which had received three days of violent punishment and re-fit Fanny’s windscreen among other things that needed attention or tightening up. By now, some of our kit had started to break or were constantly being patched up. Since our Chinese made blue tooth “in helmet” intercom set broke on our first day most things had lasted quite well, but now things were feeling the strain of the ride. My sunglasses, for instance, that I really needed for riding had broken after I trod on them in the middle of desert helping someone with a puncture. 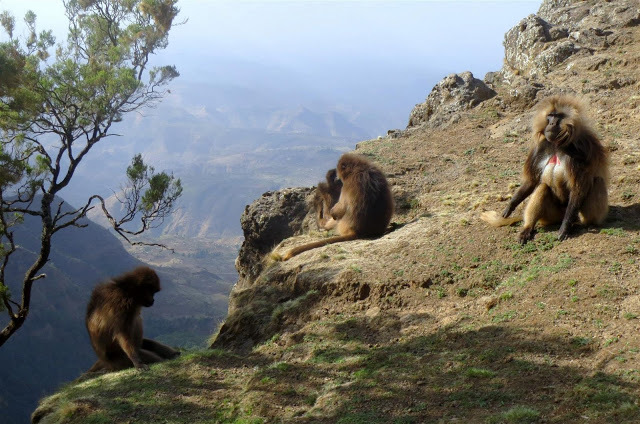 Now they were held onto my face with a piece of string which I took from my binoculars and which caused them to be a bit too tight against my face and cut into the side of my nose where I would have permanent grazes as a result for most of the trip. It also meant that I had to put my helmet on after I had the glasses already on, something most bikers know is very awkward. Another annoyance was that our South African “Thermal Comfort” camping mattresses had started to leak in Kenya and our gaffer tape and puncture kit repairs were only moderately successful, giving us 3 hours before they deflated at night. This was fine as it usually coincided with my night time weak bladder activity, but later this period of time shortened so much that I would need a more serious prostate problem to keep up with the mattress deflations. Later I employed a bit of innovation by using the gas canisters full of tyre weld to try and plug the leaks from inside, but even this started to fail as the mattresses became more and more porous. On reflection we should have bought the more robust and guaranteed Therm A Rest ones. In fairness I think the UV and the exhaust fumes did not do the material much good. And Fanny’s bike?… always a repair project in progress. Well not really, but I had to attend to the maintenance of both bikes throughout the expedition, and each time she dropped it, which was becoming much less often, I would need to repair something or another, usually the panniers, the pannier frames or the mirrors etc.. She still had the improvised indicators on and these were not looking so special, but worked. The only time I had come off so far (and I dare say this now the expedition is finished), was when I towed the broken down BMW in the Masai Mara and got yanked off on a couple of occasions when crossing muddy streams and so my bike was looking pristine, as indeed it did until the end of the trip and still does. It was well into the evening and dark when I had the bikes back to tip top condition and ready for the long ride the following day and I was very grateful for the icy Saint George’s beer Fanny brought over when she saw that I was finished with my bike maintenance duties.All bikers know the sense of pleasure that comes from staring at their beautiful machines after a good session of maintenance and cleaning. ‘How about that then, Fanbelt?’, I said with pride and satisfaction as Fanny inspected my handiwork. Fatigue caught up with both of us very quickly and we were out for the count on what we would discover in the morning were bug infested mattresses, but at least they were comfy and we could sleep feeling a bit safer and more secure than we had for days. 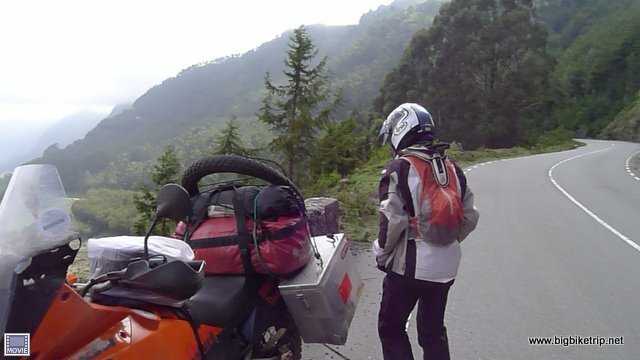 That said, I was also lamenting on the fact that the road we had been riding on for the past three days was behind us and will probably not be the test of adventure riding skill and endurance it is for much longer. There were rumours that the Chinese were going to tarmac it. In a bizarre sort of way, that would be a shame. I think all the adventure bikers I know who have ridden from Cape to Cairo or the other way round look back fondly on this tough stretch of their trips. If not exactly fondly, then definitely with a huge sense of achievement. It is a bit of planet Earth very few people will ever see, and certainly a place only a very few will ride along on two wheels. We belong to an exclusive club. Starting to climb … we would get up to 4000 meters in places. Higher than the Alps, Dolomites and Pyrenees in most places and only later when we are riding through the Himalayas in Tibet will we get so high again. GIMME MONEY .. they learn young and we give it. 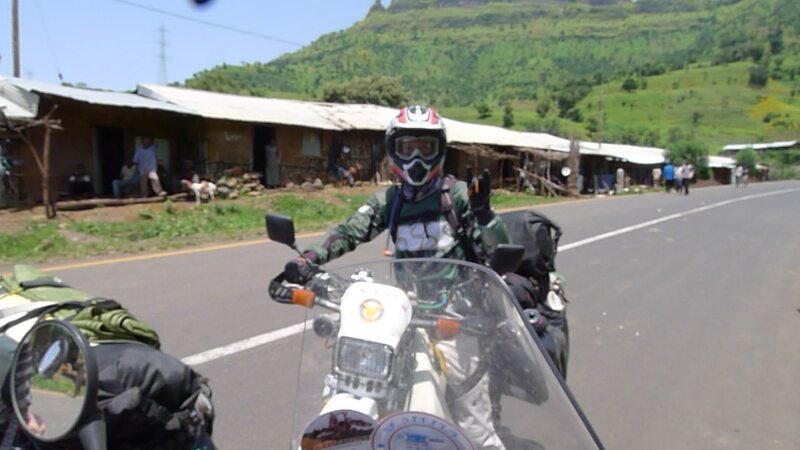 Southern Ethiopia with our super bikes. 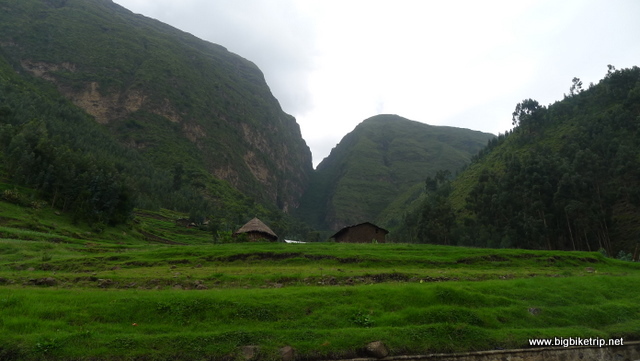 Valleys and mountains… amazing scenery. Looks familiar… our average cruising speed on decent roads. Good for bikes, good for fuel economy, fast enough to make progress and yet slow enough to smell the roses. 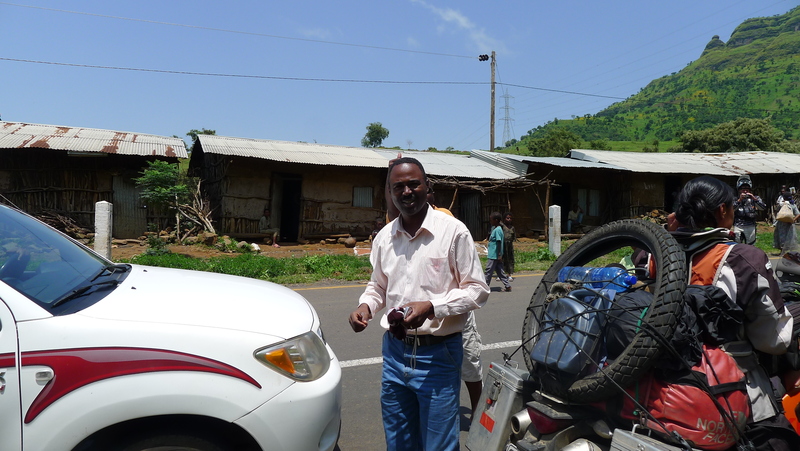 Our very nice landlord at the Lake Side Motel in Asswala. Tibis … its good stuff.. which is just as well because we will eat a lot of it in Ethiopia. 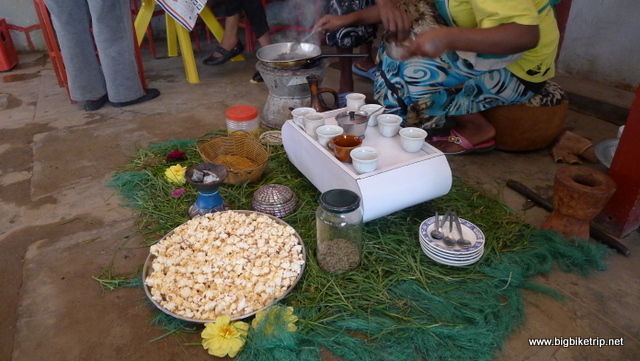 Coffee ceremony with popcorn. This was very typical and the set up always the same. 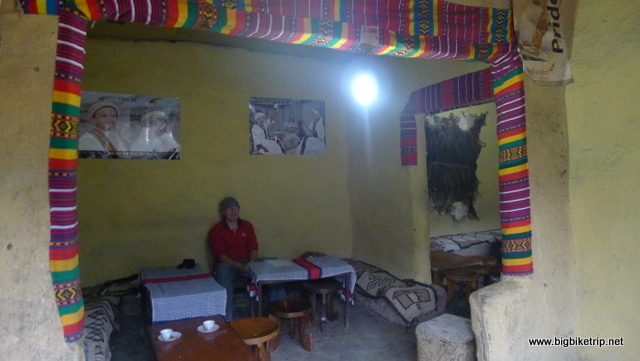 As you would expect in Ethiopia, the coffee was excellent. As it was also in Zambia, Kenya and Tanzania, but in Ethiopia it has a special place in everyone’s lives. The next day we bumped into a group of Chinese telecommunication engineers while we were having breakfast and we had a chat about our travels so far and our plans. 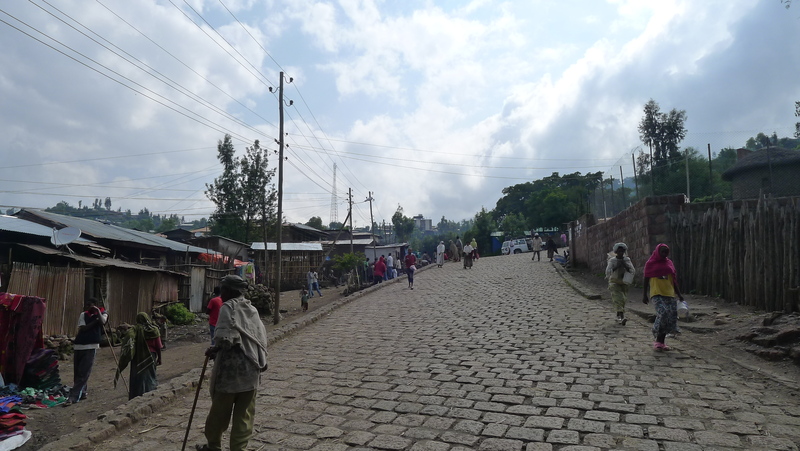 They were very forthcoming and warned us that Ethiopians are rather aggressive and that we should be very careful at roadblocks as the police often stretch a rope across the road at neck height to a motorcyclist that could potentially decapitate us if we were not alert enough. As employees of a Chinese State Owned company they had received security risk advise from their headquarters and had to reside in military camps due to some previous incidents of theft, violence and aggression. The advice about the road blocks would prove to be accurate and we had a few close shaves as the ropes and indeed road blocks were hard to see. However, to describe the local Ethiopians as aggressive was perhaps a little off the mark, perhaps charitably some should just be described as “rather excitable”. 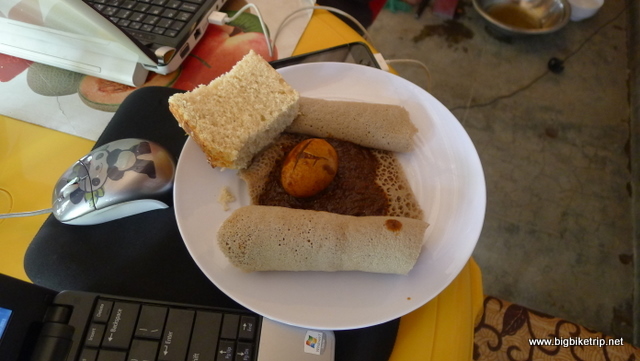 Breakfast consisted of the local dish “tibis“, a huge sour tasting wheaty pancake onto which is usually placed vegetables, meat (often goat) and a spicy bean stew. We thought it was delicious, but the novelty of the dish would wear off somewhat as this was pretty much served up at every meal. 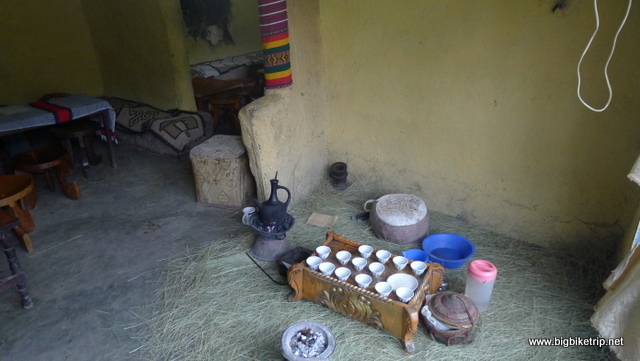 Of course, there was great coffee as one would expect in Ethiopia. 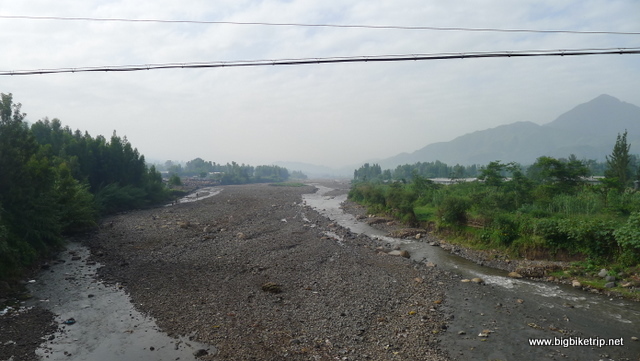 We set off early and headed north through very green and lush fields and pastures on very decent roads which had recently been built by Chinese engineers. 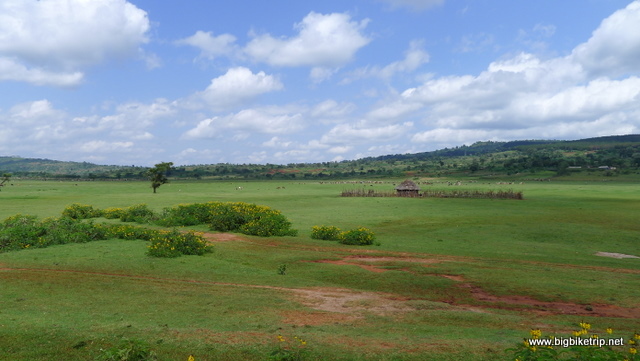 As it was early September the rainy season was coming to an end and the countryside looked glorious. There were fields and hedgerow of yellow and white flowers stretching far and wide. The temperature was about 28 degrees and the air fresh and clean thanks to the lack of traffic. 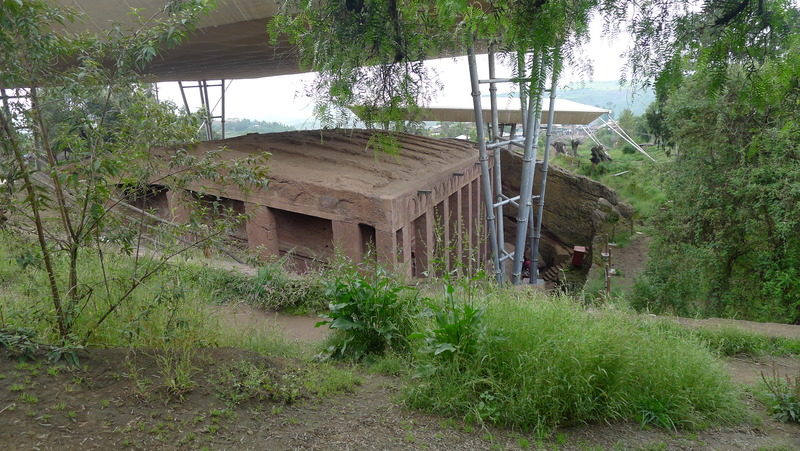 I thought about the fact that we were still riding along the Great Rift Valley and into the true Cradle of Humankind where our common ancestor, Lucy came from. 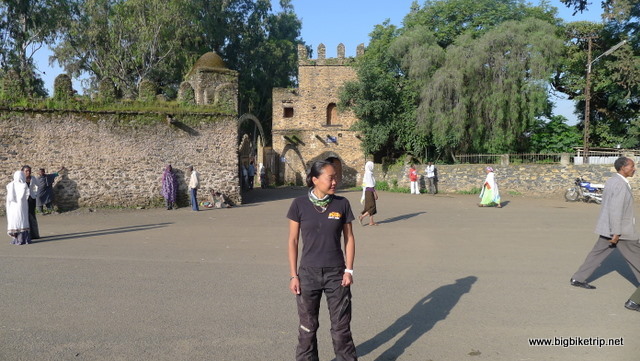 I remarked to Fanny what an amazing place Ethiopia was to ride through…like a perfect early morning motorcycle ride through Wales or Yorkshire on a sunny spring day. 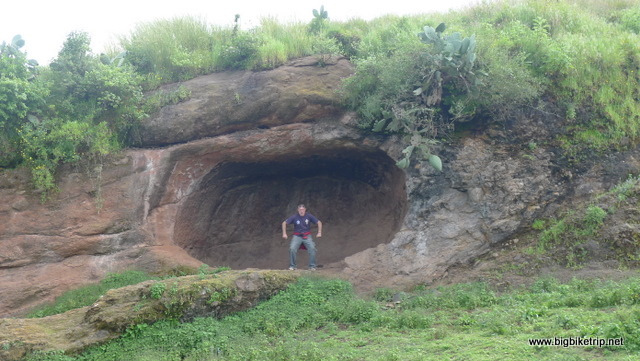 This was the Garden of Eden and surely all the negative reviews we got from fellow travelers who had journeyed through Ethiopia were exaggerated. 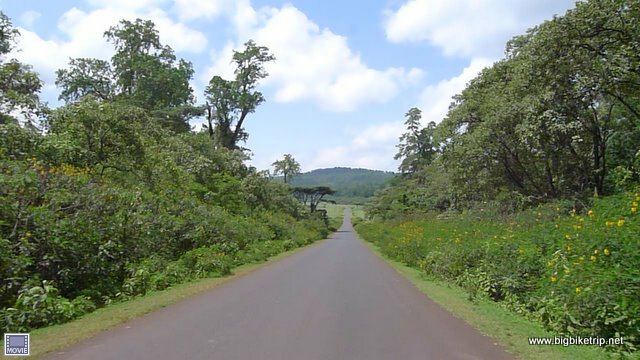 I continued to marvel at the beautiful roads and pristine surroundings as we rode leisurely through fields of flowers and past the occasional villager or child who would wave enthusiastically towards us. After a few hours we stopped for a call of nature and were suddenly swamped by kids. Where on earth did they come from? The only words many of them knew in English were ‘Money, money, money’. Poor little things I thought and then felt my “nuts” being moved about inside my trousers and looked down to see an angelic looking child of about three or four with its arm in my trouser pocket. ‘HEY’, I shouted, ‘OUT’ and with some effort removed the thieving little arm and resisted the urge to smack the back of its smiling snotty head. Arms were everywhere trying to liberate us of our things. We had some sweets to hand out and we did so and then we got back on the bikes with a few little friends still hanging onto us and our bikes. The effective Akropovik exhaust crowd dispersal technique was again used to very good effect, literally blasting a small urchin trying to get into our panniers off the ground. 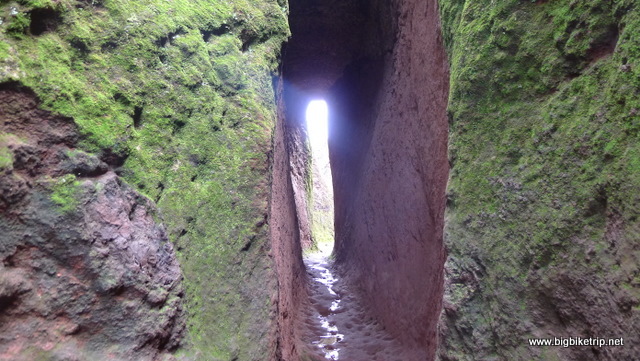 And so started our descent into a sort of underworld, much like the horror movie, “The Descent”. The idyllic landscape remained the same of course, but the density of people got greater and greater as we entered our first and last village, for it never ended. As soon as one looked like it was ending another started. Its interesting seeing all the people going about their lives, but at the same time a bit depressing seeing the obvious hardship and poverty. The Chinese tarmac was covered in people, goats, dogs, cows and occasionally camels. Each animal requiring a different approach to get around safely and swiftly. People waved, shouted and sometimes tried to touch us, throw stones or wave sticks dangerously close to our heads; dogs would skulk about, or just sleep on the road in the sunshine; donkeys would just stand stubbornly in the middle of the road and only be persuaded to move with a vicious whack administers by some young kid with a stick or with a lash from a bull whip; cows were preoccupied with moving from roadside grassy snack to another, only being deviated from this preoccupation when whipped savagely; and goats? Completely stupid creatures. Impossible to predict and we saw a couple taken out spectacularly by the speeding buses, being tossed into the air and landing in a shaggy lump on the road. The road kill was always hurriedly taken away, after the compensation negotiations had been resolved, no doubt to reappear in pieces on top of sour pancakes. Dogs and other creatures that had been mashed by wheels were often left for the many vultures and carrion birds that would busily and messily feast on the decomposing and smelly carcasses. Lunch anyone? The road started meandering upwards into mountains and the scenery became even more spectacular, although the eternal village continued and the density of roadside creatures increased. Although the rainy season was coming to an end, I saw suspiciously black clouds on the horizon. The road really weaved about, left and right, up and down, and we caught glimpses of the lakes through the clouds and valleys. It was like a roller coaster and I was becoming a bit disorientated as the sun was obscured and my compass on the GPS was spinning as if we were in the Bermuda Triangle. I was starting to think about where we should camp up and then the rain started, got heavier, even heavier and then truly torrential. As heavy as the tropical downpours I had experienced in Hong Kong, Singapore and Kuala Lumpur, perhaps heavier. The sky was almost completely black and it was extremely difficult to see anything as not only had the rain and dark obscured everything but our visors started misting up. We were soaked through immediately and so there was absolutely no point stopping and seeking shelter, but we crept cautiously along water logged roads and navigated across streams and through quite deep ponds that appeared across the roads. The “village” had suddenly become deserted, but I could just about see clusters of people huddled under any form of shelter, peering at us riding by with mild astonishment. 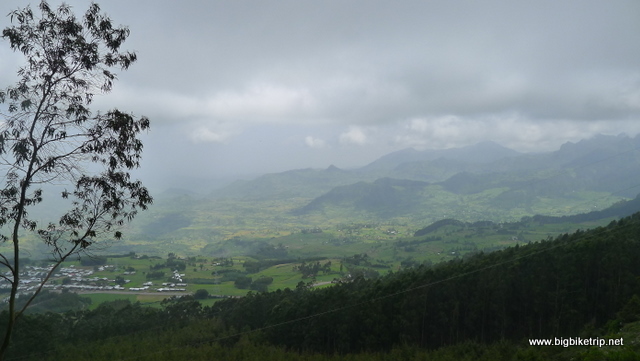 The rain continued for about two hours and we only made about 30 kilometers progress and then started descending into the first big city we had been to in Ethiopia, Dilla near one of the big mountain lakes. Dilla did not look that appealing, and so I discussed with Fanny whether we should carry on to a town next to Lake Awassa that might be quite interesting and we agreed to push on for a further hundred or so kilometers. 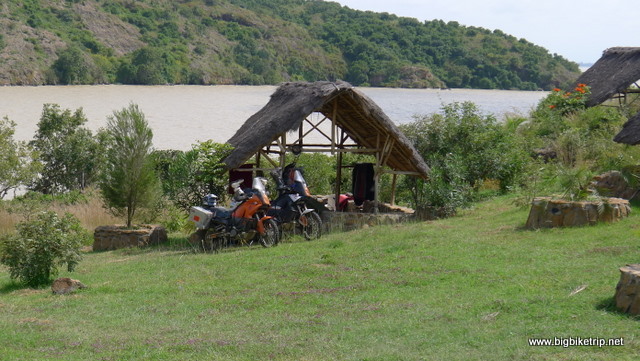 When we arrived in a town, called Hawassa, we aimed for the lake where I presumed accommodation might be found around the shores, or better still find a camp site. The GPS program, “Tracks on Africa” was now giving very erroneous information. The maps were OK in a where’s north and south sort of way, but the data about accommodation, petrol stations and points of interest was seriously out of date. Later we would find out the road information would also be inaccurate too. By trial and error we ended up at a modest hotel next to the shores of Lake Awassa, nothing very special, and certainly the sort of place my junior forensic auditor colleagues in the day would have turned their noses up at had we booked them in on a project, but the sniffy receptionist was demanding US$100 a night, about US$90-95 above our budget. 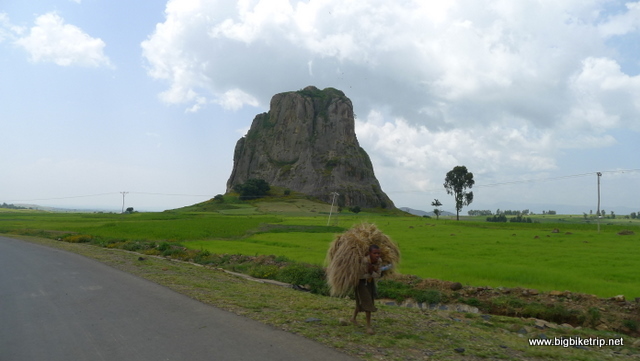 We knew that hotels were cheap in Ethiopia— everyone had told us so —and so we back tracked along the road we came and saw a hotel, just called “Motel” as the rest of the sign appeared to have fallen off. After pulling in and discussing our requirements, primarily somewhere to securely park our bikes and perhaps with running water we were taken to a very nice room in what we later found out was called The Lake Side Motel. We had ridden close to 600 kilometers that day along roads that needed a lot of concentration and evasive action and to say we were grateful is an understatement. Unpack, arrange and secure bikes, take off wet clothes that had actually dried out quite a bit already, and a very welcome shower. That evening we sat outside the Motel’s very popular restaurant called “Dolce Vita” and had a very good meal of lake fish and –yes — tibis again. When the bill came I had to to double check the exchange rate. Blimey… less than a pound for a very decent dinner for two people with drinks. The room rate wasn’t much more. It was certainly cheap in Ethiopia and if you searched you could find excellent places to eat and sleep for next to nothing. The next day after breakfast we set off looking for petrol as usual. 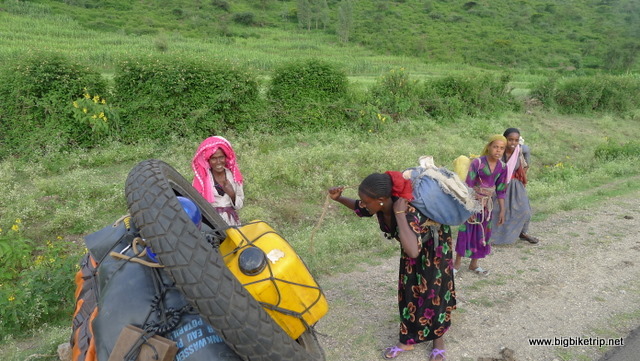 Ethiopia proved to be challenging and a bit worrying on that front and the spare fuel cans were always used to extend our range between stations in most of Africa. Again the GPS’s data was often out of date and it required random riding about in places where we thought one would expect to see a station. 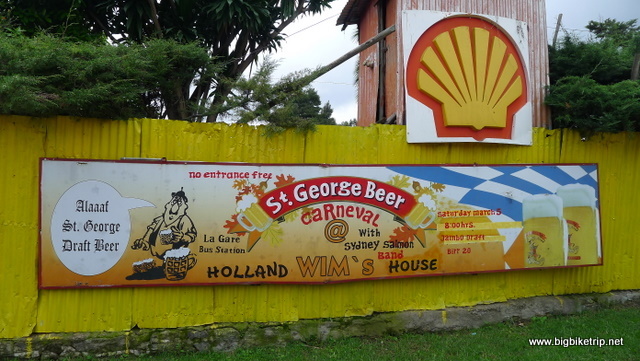 I insisted at each petrol station that I filled up myself using the “Steve Thomas” fuel filter, often with messy results as the pumps would not automatically stop and we would have to guess when it was about to overflow by how many liters had gone in. 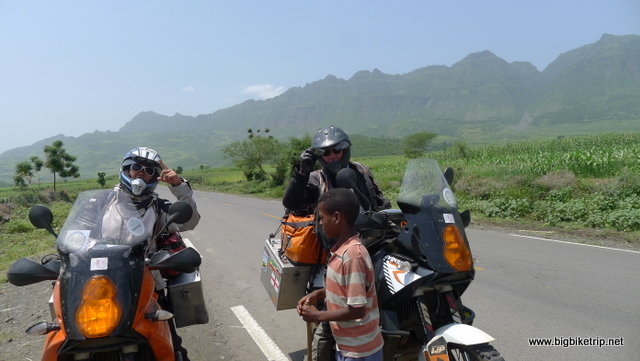 We couldn’t afford to ride without the tanks being absolutely 100% full and so our bikes and gloves constantly smelt of petrol throughout Ethiopia. I could tell by the engine sound, and performance, even on the low ECU mapping setting, that the octane level was well below 80 and so octane booster additive was also added to reduce the knocking and help the EFi system, especially at high altitude. Be careful on the last 80 kilometers into Addis Ababa everyone had told us, the traffic is treacherous they all said. 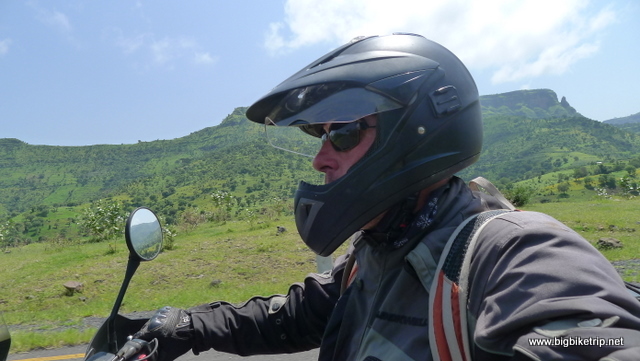 We had 400+ kilometers to ride to Wim’s Holland House, our rest stop in Addis Ababa and on the way traveled along increasingly busy roads, albeit mostly with trucks and buses heading in and out of the Capital. At the beginning it wasn’t such a bad ride as the route north took us past many beautiful lakes, such as Abijata, Ziway, Koka and we saw a huge number of water birds and birds of prey, including the classic vultures with the furry necks. 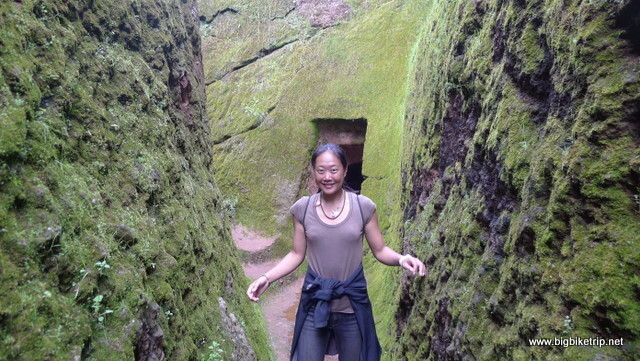 I would like to have gone off the beaten track more and seen more wildlife and nature, but we were pressed for time due to our illogical and unreasonable visa limitations. Surely Ethiopia and other countries in Africa should encourage tourism, encourage foreigners to spend their cash, encourage investment. But no… seemingly they raise revenue by fleecing people with bogus charges and fees at the border. 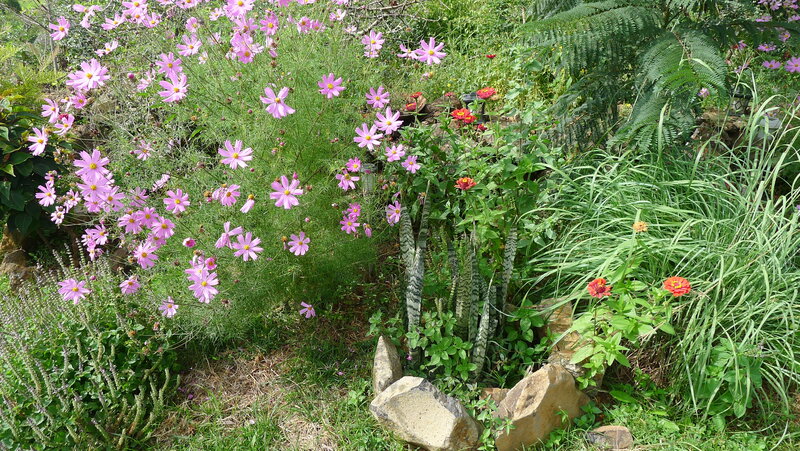 Take South Africa for instance, it offers three month visas (well to most nationalities .. not to Chinese people) and does a great job to encourage tourism to one of the most beautiful countries in world. The rest of Africa which is just as beautiful in its own way, especially north Africa seems to go out of its way to discourage tourism and make travel difficult. 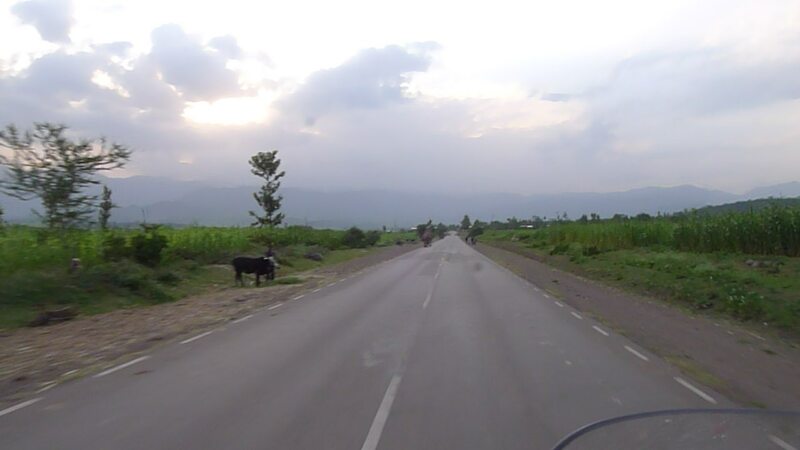 When we hit the big T-junction at Mojo we turned left onto the notoriously bad road section towards Addis. It was indeed an extremely busy bit of road with head to tail traffic, but nothing two residents from Shanghai couldn’t handle with ease on two powerful motorcycles that can overtake quickly and squeeze through gaps between the vehicles. 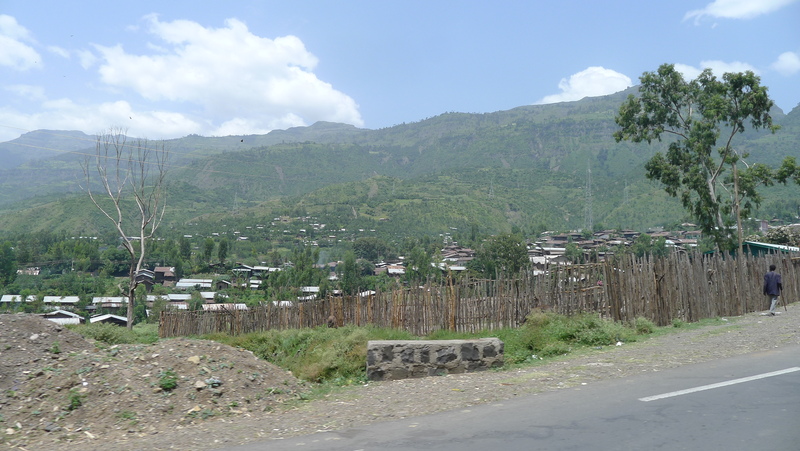 ‘Wasn’t so bad’, was Fanny’s comment as we weaved and honked our way into Addis Ababa. ‘It wasn’t that brilliant either, was it?’, I replied. ‘Let’s get on and try and find Wim’s’, and with that we followed the GPS as it took us the wrong way up one way streets, down dead ends and off road through constructions sites and occasionally through people’s private property. We eventually pulled up outside Wim’s Holland House in the most unlikely of places… right in the city centre next to the decrepit and now disused central railway station that looked like a film set from a post apocalypse movie like, “I am Legend”. Wim greeted us when we arrived and asked if we would like to camp or stay in a room. It had been raining a lot and I looked down and squelched the camping pond with my boot and asked how much to stay in a room. We were shown two, one for about two Rand and another for a Rand. They both looked like prison cells, with no windows and with a shared outside bathroom with a dodgy water pump and a blocked drain. Forcing a smile I said ‘Thanks, Wim, that will be nice, we’ll take the cheaper one without the meat hooks on the wall’. We had brought a good mosquito net with us which we strung up using our pannier bungee cords above the beds as Ethiopia is insect heaven. I parked the bikes in the pond against a tree so they wouldn’t fall over and then we went over to the bar. Wow… a proper pub. Now I knew why people came here. I ordered a beer and was asked if I would like a bottle or draft. The little things in life, you only miss them when they’re gone. ‘Um… Oh… Draft, please’, I replied, hesitating over the rare opportunity to decide between choices of beer. Fanny? A bottle of Orange Fanta, of course. It was Ethiopian New Years eve and so we decided to have a wander around the city center of Addis Ababa as the sun was going down. Woman were wearing traditional white dresses for the occasion that looked like, well, brides maid’s dresses to be honest. They arranged their long curly hair in plaits at the front only, a style I had only seen in Ethiopia. Grass was laid out in places where some of the woman were preparing coffee which was served with popcorn, A traditional coffee ceremony we were told. There were also quite a few Rastafarians hanging around and reggae music was blaring out from a solitary loudspeaker, but generally these efforts at jolliness were overshadowed by obvious poverty and decay. Sweets and candies were taken out of their wrappers and packets and sold separately on street corners. I have seen this in South East Asia and it always strikes me as a red flag of poverty. 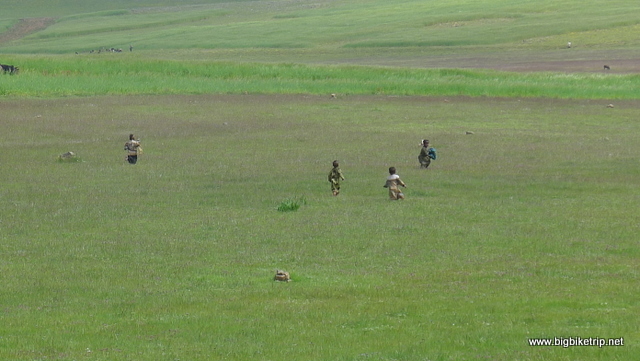 In Addis there were hundreds of kids and even some adults doing this. The buildings looked awful and the squalor and rubbish was depressing. The more we explored the more depressing it became. 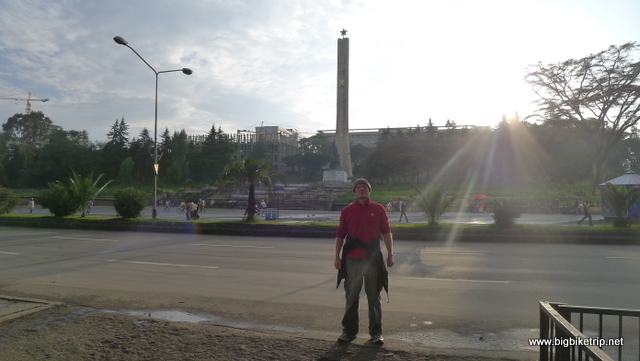 We wanted to wait in Addis for Paul and Marja to arrive and also go to the museum to see Lucy…. 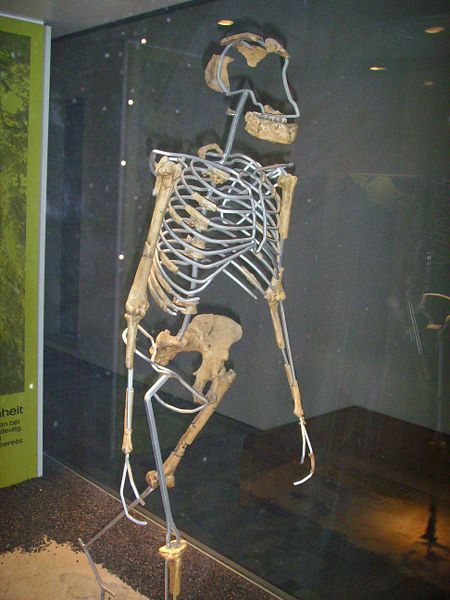 Australopithecus afarensis ….a fossilised humanoid skeleton about 3.2 million years old. We were very kindly invited to the New Year’s day celebrations which involved a traditional lunch prepared by Wim and his wife with other guests. Again,Tibis was the main course, but there was a rather spicy dish that was absolutely delicious, and of course popcorn that seems to appear at every meal. 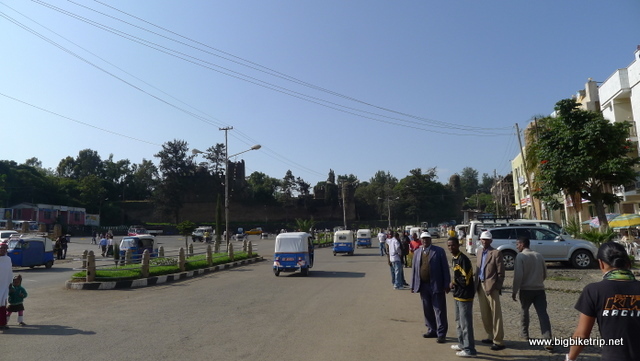 We found out that Addis Ababa National Museum was closed … and no one had any idea when it would open. 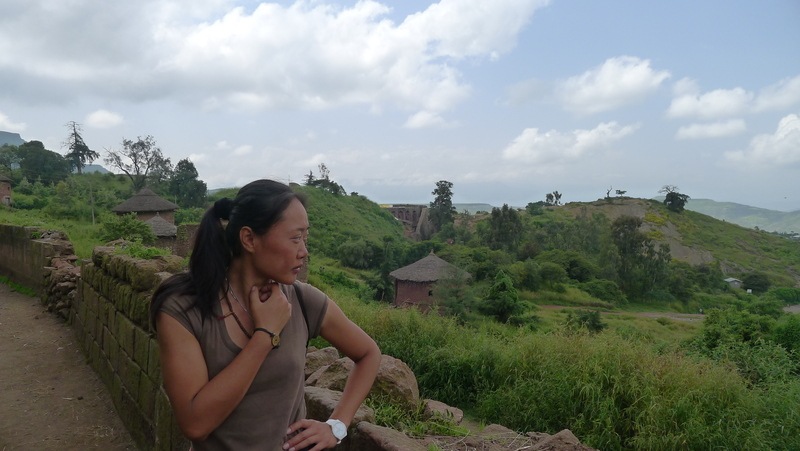 So too was the immigration department, the only place we could possibly extend our visas and as the clock was ticking and as we had no reason to stay in lovely Addis any longer we decided to leave… 马上. I was disappointed it was so awful and wondered where the LWD guys had stayed and why they liked it. We could see nothing charming or interesting about it. I am quite sure that if you have the money, as they no doubt had, there were very nice places to stay and eat at. 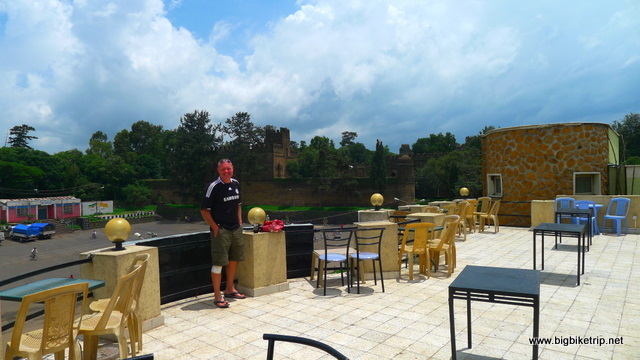 Actually Wim’s Holland Guest House was great… all part of the adventure, but I have to say we were both disappointed with the capital of Ethiopia. The next day left Addis very early, or at least tried to, going around in circles trying to find the road to Wadhaya, riding through shopping malls, the wrong way up streets and being chased off by unpleasant and aggressive policemen each time we got lost and stopped to consult the map or inaccurate lying GPS. We had refueled the bikes with something that smelt vaguely like petrol, leaving bits of debris in the Steven Thomas filter but eventually managed to escape and head for the hills. We really wanted to go to the Afar Region and Danakil depression to the the north east of the country, but with time running out on the visas, reports of heavy rains, a shortage of petrol, and trouble on the borders to the east with Shiftas we decided to engage in a bit of culture and visit the 900 year old monolithic churches hewn out of rock in Lalibela. The run down railway station. Once it would have been magnificent. Now? Not so. I think the guy is actually alive… but you never know. A little oasis in the middle of the city.. Wim’s Holland House. Great place . The picture looks a lot nicer than it actually is. To be fair it was dry (ish) and very cheap. We had a safe place to park our bikes and a central base to explore Addis Ababa. In fact, there were two young BMW riders from England in the room next door and their GS650 ‘s were actually in bits inside their room while they were waiting for spare parts to be shipped in from Germany. 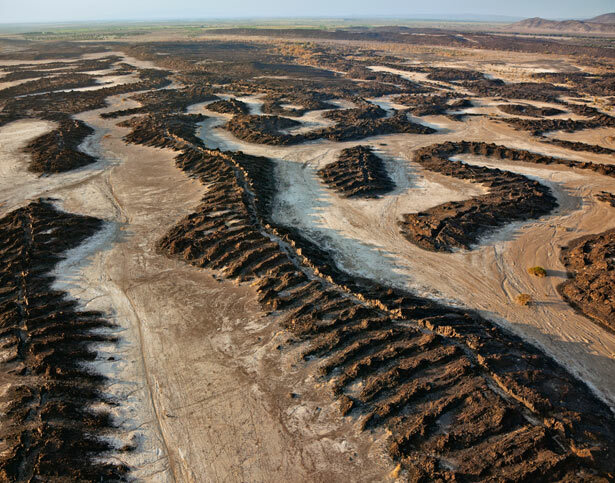 The Afar/Danakil depression area … we were pressed for time by the visa restrictions and its my big regret that we never saw it. An excuse for another visit I hope. The ride there was long, but an excellent one and we started riding back up into huge mountain ranges along steep windy roads with precarious cliff sides. 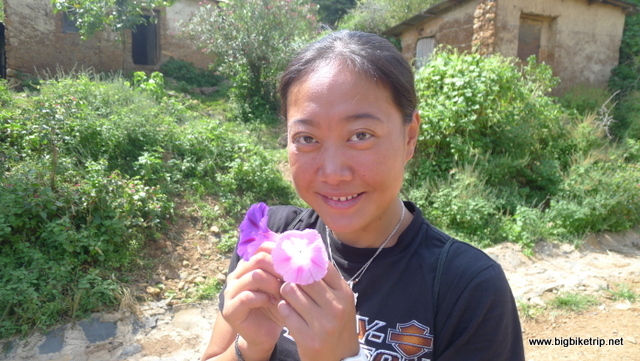 Fanny complained that she was scared of heights and certainly this phobia was tested as we looked down many thousands of meters across lush valleys. The donkeys, goats and cows were back again in huge numbers on the road, and so were the brats throwing stones. 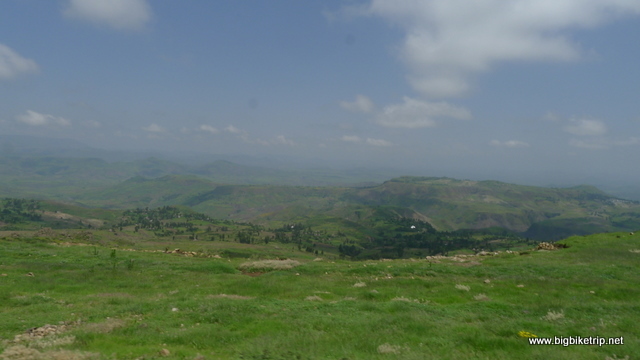 The altimeter on the GPS showed us at over 4,000 meters on one occasion as we rode along a spectacular mountain plateau to the turn off down into the Amhara region towards Lalibela. On one occasion a stone thrown from the side of the road by a small boy hit my helmet and momentarily stunned me. Right, that is it I said to myself. I yanked on my anchors, leaped off my bike, but not before grabbing my catapult and pips (prune stone ammunition) kept in my tank bag, and legged it as fast as anyone can in Alpinestar motorcycle boots towards the brat who was literally frozen on the spot. He then came to his senses and made a fatal mistake by running into a field… open ground. Still running at a fair pace I loaded, employed the marksmanship principles learnt as a child and perfected as a tactical policeman with perhaps more lethal weapons. Breathe out, hold it, aim and fire. I watched with increasing glee as the prune stone arched through its trajectory and landed on the brat’s skinny arse resulting in a satisfying yelp. Lesson #1 in my Ethiopian brat behaviour modification campaign. Later the same day a youth in his late teens swung a stick at me whilst laughing with his friends on the road. Had the end of the stick actually connected with me I would definitely have come off my bike. Fortunately I anticipated the swing of the stick and managed to duck. Had Fanny been leading who knows what would have happened. The miscreant received the same treatment from the catapult and disappeared quickly into a house only to appear again and have the audacity to pick up a rock, but while his arm was arched backwards in mid throw he was hit again squarely on the side of the head causing him to drop the stone and so he ducked back into the house never to be see again.. well not by us. Following an Anglo Saxon expletive filled lecture to his stunned friends we roared off again. Quite sure nothing was understood except the sentiment and the expression beginning with F that sounds like clucking bell and the C that sounds like James Hunt. Ahh!, the joys of cross cultural expression. On other occasions small kids who I saw pick up stones and consider throwing them were too preoccupied waving back to us if I managed to waved at them first. A better technique I suppose than violence. We saw too much of that, especially directed towards their poor beasts of burden that were constantly whipped and beaten savagely. I increasingly hated the sight of it and no doubt it has added greatly to my negative and rather jaundiced view of the country which I am sure at least one of my three readers will think is unfair. BUT…I worked on a diary farm for years as a child and teenager and never saw domestic animals being beaten and so I do not know why these children, some very young, are brought up to behave in this spiteful and savage manner. 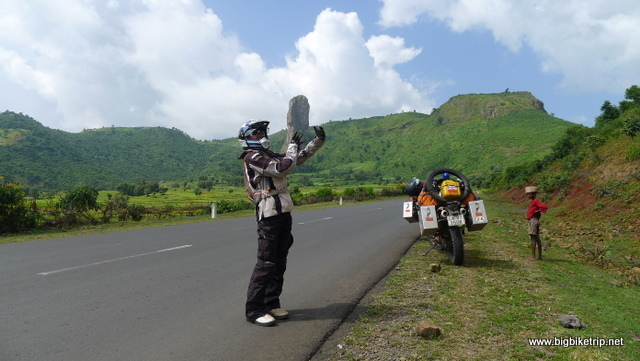 In the absence of any appropriate socialization I hoped my few lessons in “cause and effect” made a few think twice about stone throwing and that it may at least prevent serious injury to some other motorcyclist travelling through Ethiopia in the future. 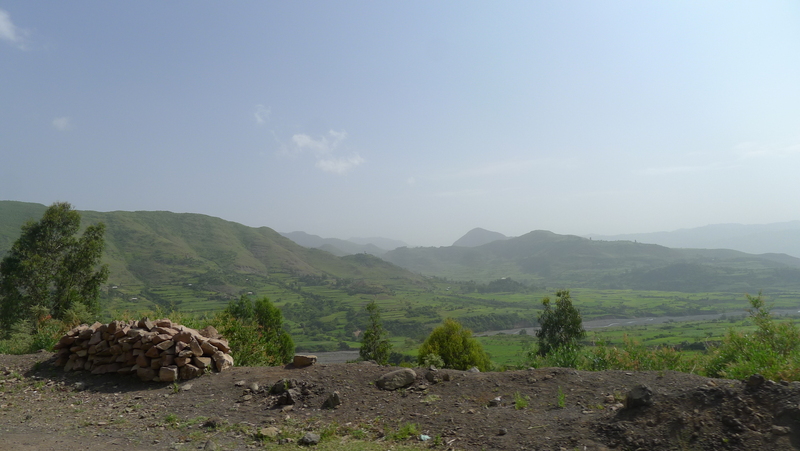 About 70 kilometers from Lalibela the road turned to gravel and we zigzagged up and down hills and across rivers and through streams. 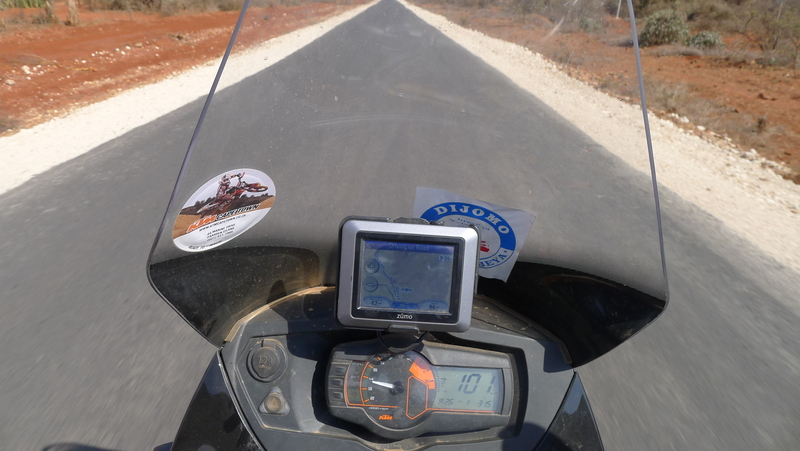 Enormous fun and I was secretly happy that all the technical riding had not finished at Moyale. The scenery was amazing, much like the Alps in Switzerland or Austria. Spare a shekel for an ex leper.. I mean an ex forensic accountant who has been ripped off savagely and unfairly by FTI Consulting Hong Kong. 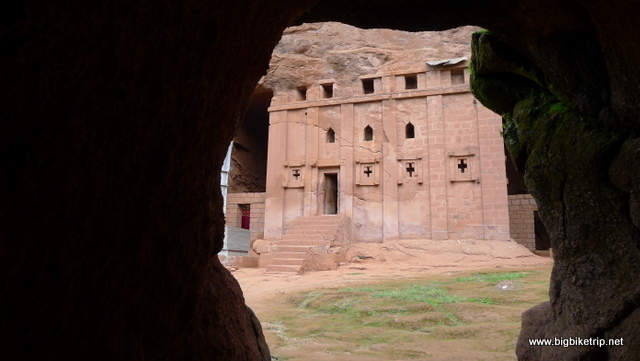 When we got into the town there was no immediate sign of the dozen or so Coptic churches that Lalibela is famous for and Christian pilgrims come from all over the world to visit. In fact, it was full of touts and people begging. 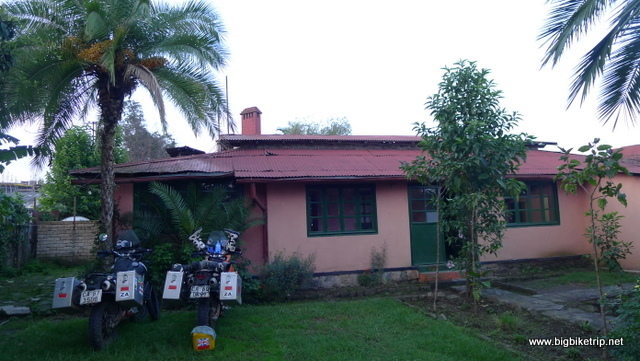 We found and stayed at a very basic and cheap hotel that was recommended by other travelers. It was basic, perfectly adequate for a night or two, and much like many of the others we had seen in Ethiopia thus far. We ate Tibis for every meal at a family run restaurant across the road in which we could watch English movies on an old TV. When people were not begging, throwing rocks or touting they are actually extremely nice, friendly and helpful. 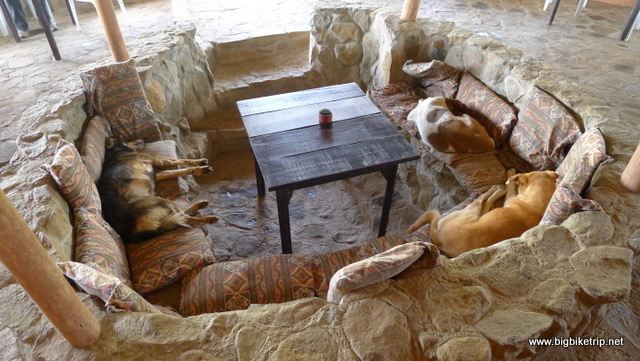 The little restaurant was very pleasant, except that we both got viciously bitten by fleas that seemed to be everywhere, especially in the carpets and soft furnishings. 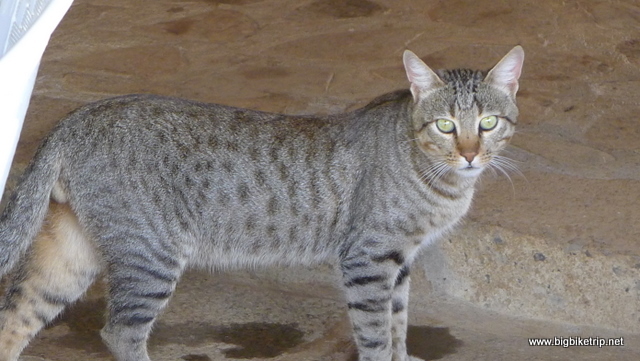 We were scratching and shaking them out for days until we got re-bitten all over again at Lake Tana. 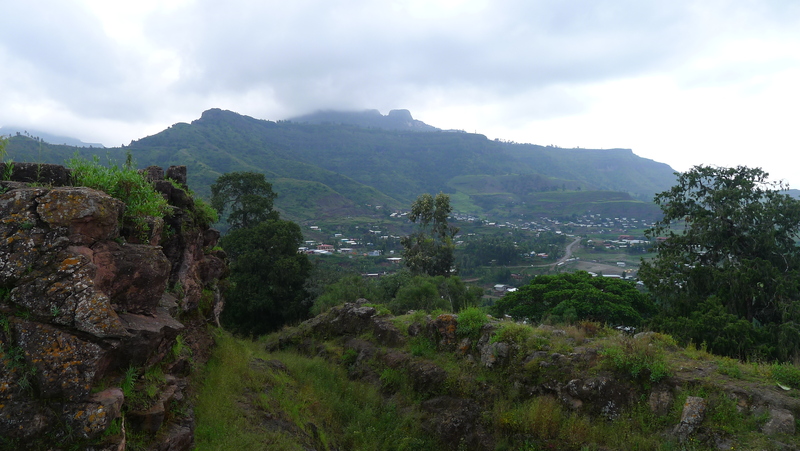 The next day we explored the town which was for the large part very scruffy and found the site for the old churches. The entrance fee was 300 Ethiopian Birr each, way too expensive we thought and so we made the cardinal sin of deciding not to go. 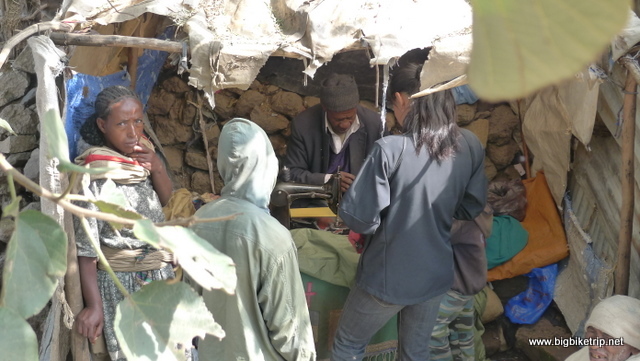 Ethiopians could go in for free, but foreigners had to pay which I thought was patently unfair. Could you imagine if the UK National Trust only charged foreigners for Stonehenge or the Tower of London in England. Outcry from the PC brigade no doubt. If fact, such is the way in England is nowadays I am sure it would be the English who have to pay and the visitors can go free. China also charges foreigners considerably more to visit parks and tourist attractions than they do for Chinese citizens. I think everyone should be treated the same. 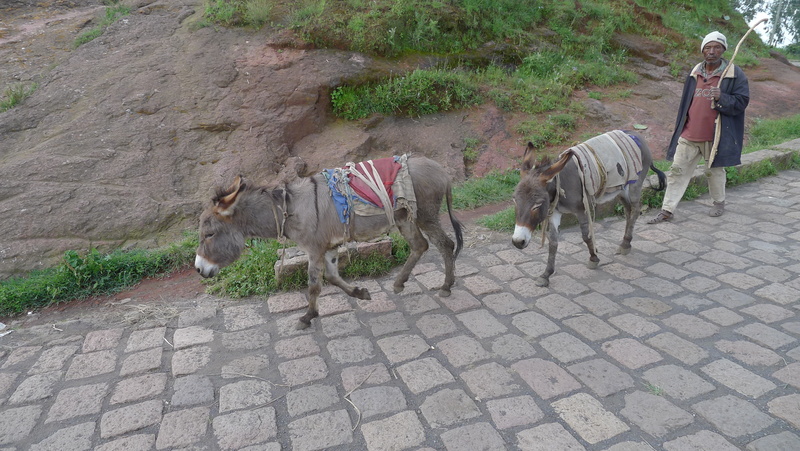 We both thought it was amusing, if not a little sad that we had ridden all the way to Lalibela in Ethiopia and did not go into their main tourist attractions. Of course we did the same with the Serengeti in Kenya, and would do so again with the Valley of the Kings in Luxor, Egypt. 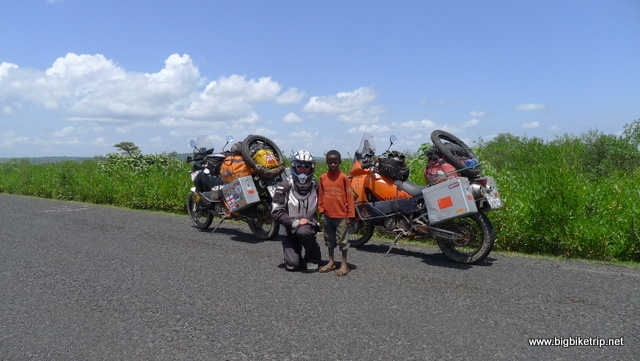 The expedition was all about riding our bikes and seeing as much of the world as we could. 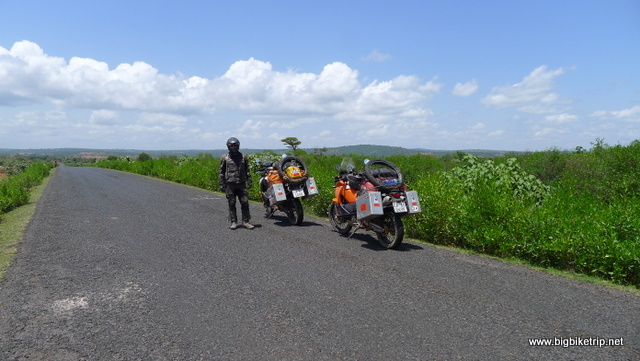 But given our finite and limited budgets we could not afford to pay to see every tourist attraction that we came across throughout or 50,000 kilometer ride. We had no sponsorship, no financial assistance, no support and everything was self funded. 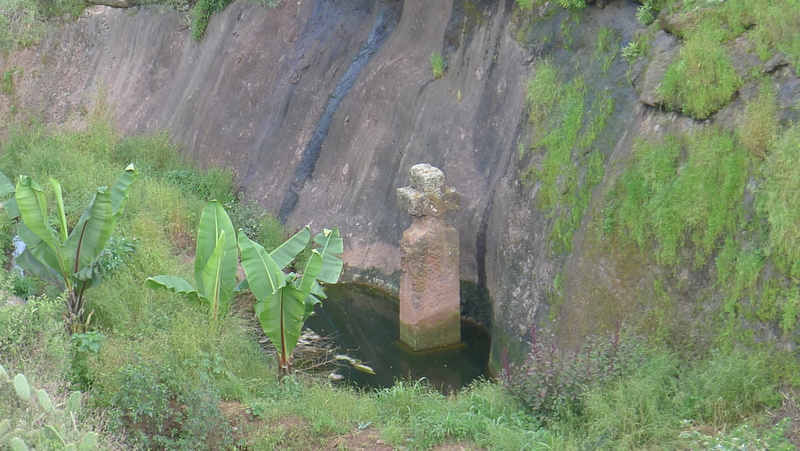 Tourist attractions and activities were off the itinerary unless they were cheap or free ..and so no gorillas or chimpanzees in Rwanda, nor rock hewn churches in Ethiopia for us. Unless of course we can sneak in… ???? 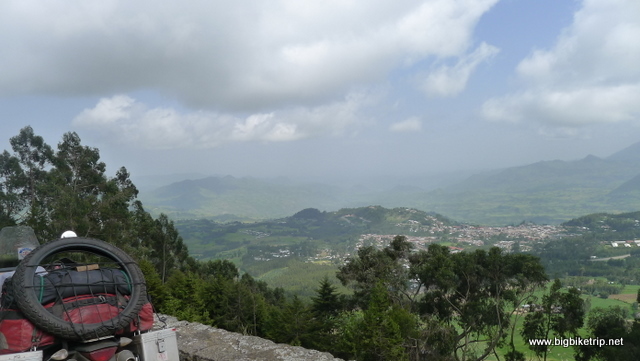 So we actually hiked around the mountain side to a position where we could freely see a lot of the archaeological sites, churches and take some pictures. It was fairly interesting if you are an archaeologist or Christian Pilgram, but I have to say the Norman church built about the same time in Abbots Bromley in Staffordshire where I was brought up is far more interesting and spectacular, less fleas, you can get in for free and get a wafer and a swig of wine. Salisbury Cathedral and the Pantheon in Rome? No contest. Later we will employ the same “get in free” tactics, or ride our motorcycles as close as we can to other tourist sites in the world such as the Valley of the Kings in Luxor, Marine Park in Ras Mohammed, St. Catherines Monastery in the Sinai, the Pyramids and Sphinx at Giza, Jokhang temple in Lhasa Tibet, and Mont. St. Michel in France…. to name a few. one, two, three flea bags … with the odd tick. Nice. 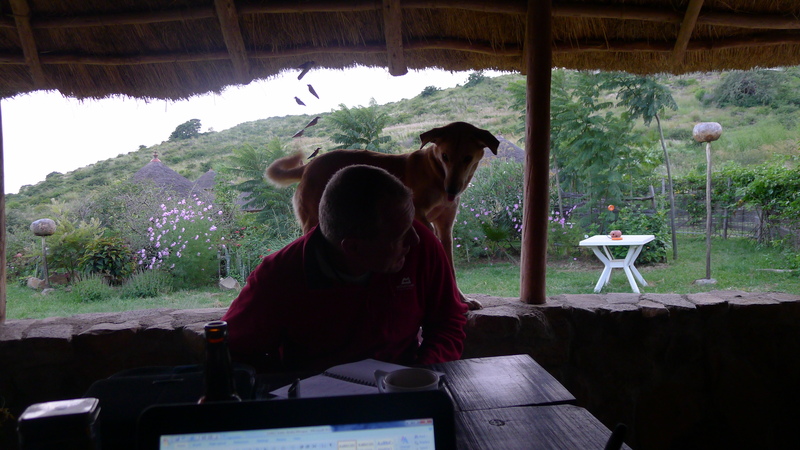 You could see the fleas jumping off the dog and into my food… yum .. more protein. 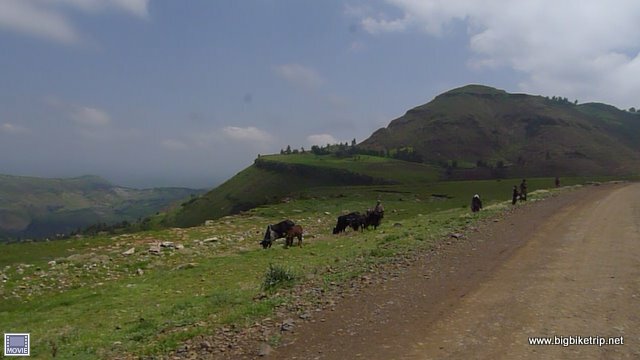 Around the Lalibela area, while filming with the GoPro camera whilst standing on the foot pegs I had a momentary lapse of concentration as I forgot that cars drive on the right in Ethiopia and narrowly missed an on coming and speeding van. It was a close call and a very loud wake up call to ride more sensibly. Fanny also had a fall, an increasingly rarer occurrence as her riding was by then really good, but she stalled on a hill saying she forgot to shift the gears down from third to second. It happens when you’re tired, but the panniers and crash bars were bent slightly again, to be fixed later. I was becoming as much an expert banging out the panniers into shape as Fanny was with picking up a fully loaded 990 Adventure. 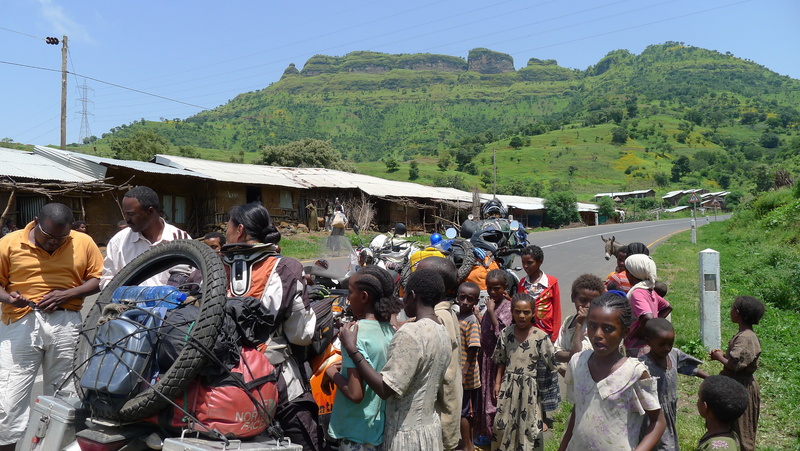 After doing as much as anyone can do in Lalibela for free we loaded up the bikes and shipped out, riding back along the gravel and mud section that we came and back up into the Simien Highlands and towards Lake Tana and Gonder. 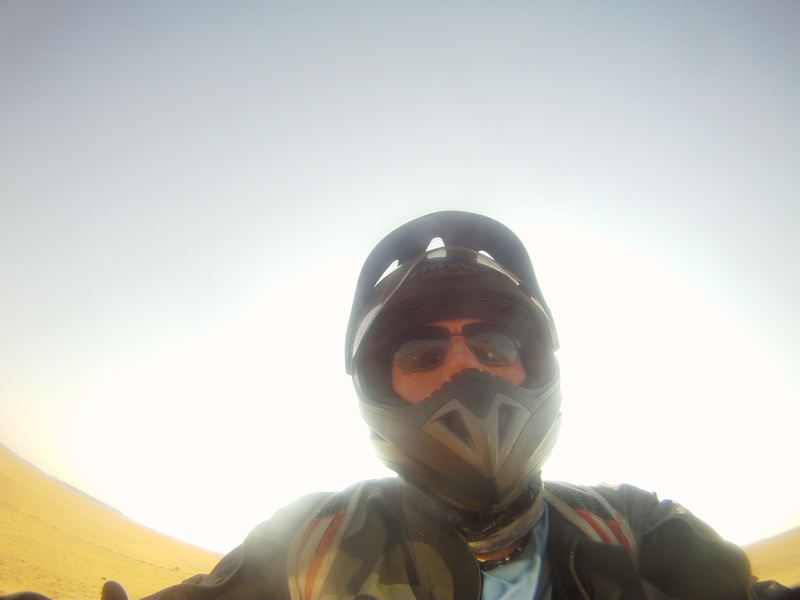 Again an awesome ride in spectacular mountainous scenery and very comfortable and sunny weather. 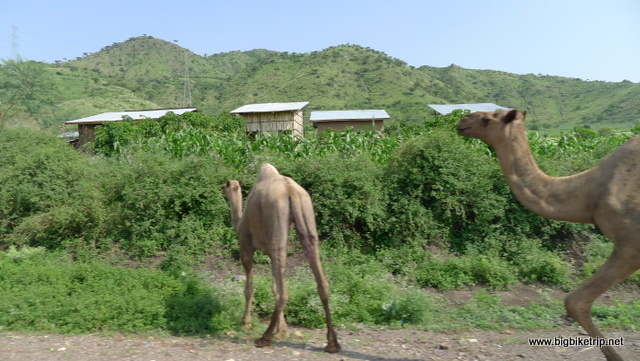 As we got nearer to the north west of Ethiopia near to the Sudanese border we noticed that the general levels of anti-social behaviour had decreased somewhat. That is except from me. 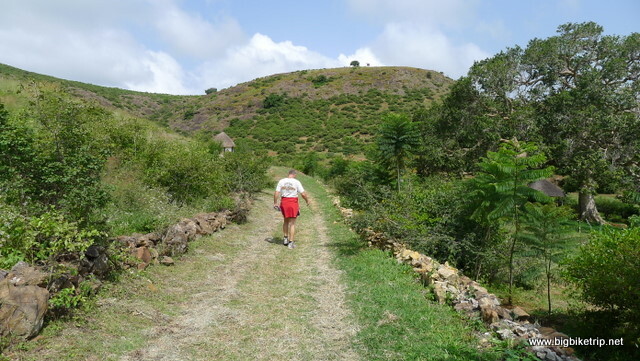 I am afraid a fortnight’s diet of Tibis and beans was taking its toll on my digestive system and I had to spend a lot more time standing up on the foot pegs than is really required on a smooth tarmac road. Better out than in, and as my trusty travel companion noted, better on the bike than in the tent. 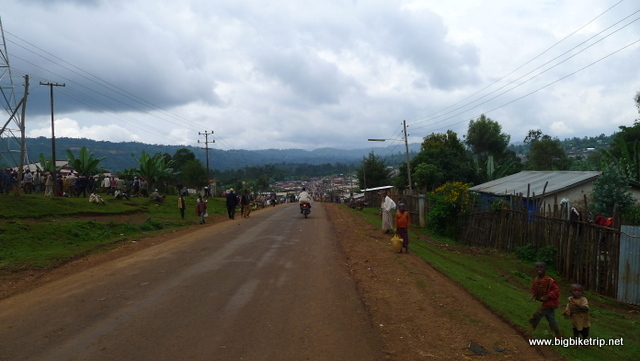 We eventually got to a very nice town called Gonder, re-fueled at a decent petrol station and then headed due south for sixty kilometers or so along a muddy dirt track to a campsite called Tim and Kim’s. Now if anyone from my former company, LECG is reading this they will see the inside joke, and I was laughing to myself at the coincidence, especially as the place was full of donkeys going “EEEE OOOOR”. Anyway, Kim has a new stable at a firm called Control Risks … EEEE OOOORRRRRR and Tim is at a Chinese firm teaching their compliance team how not to make any decisions of any kind … ever. I really miss those guys… they made me look good. Just before I went to watch Chelsea get beaten by Man U in the cinema … still it was good fun. We are joined by two very friendly guys who are from Sudan. 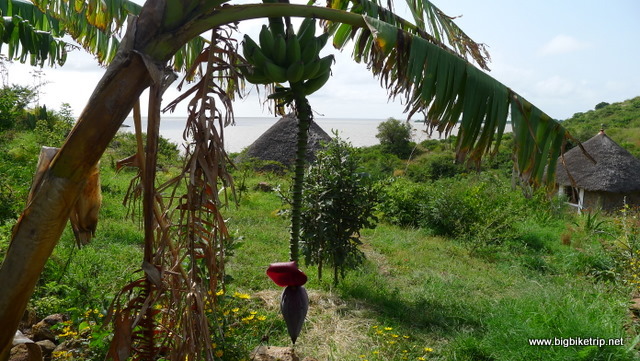 Anyway, the other Tim and Kim are a young Dutch couple and run a very nice camp-site in very lush countryside on the north shores of Lake Tana. 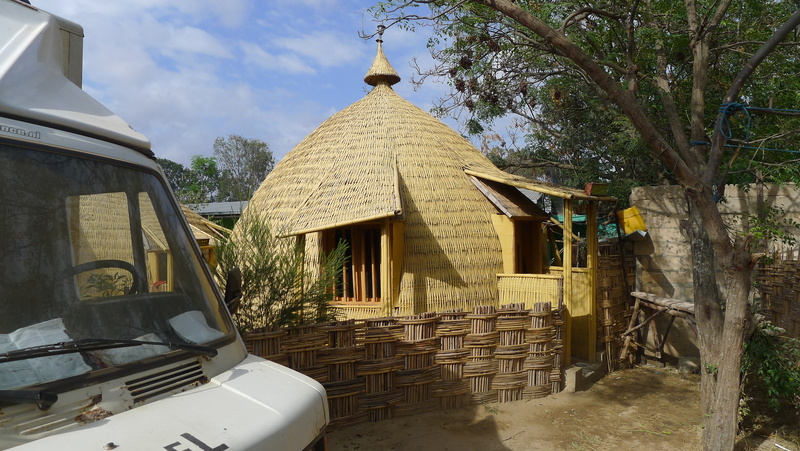 The place was being refurbished when we visited to make it completely self contained with, solar panels, recycled water and electricity and had six self contained huts, a bar, a restaurant and a large grassy area with thatched shelters for camping. 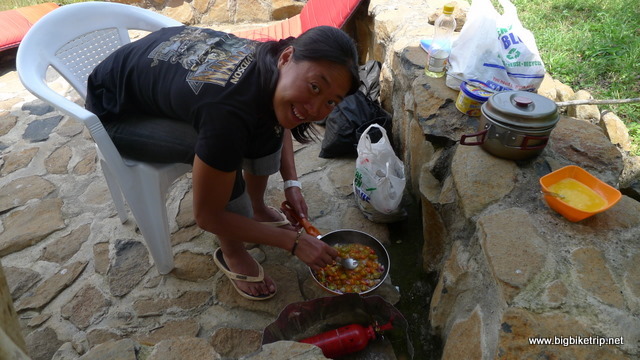 When we arrived we were the only guests and the cook and many of the staff were missing and so we set up camp, got out the Whisperlite cooker and Fanny prepared a spicy Chinese cabbage dish (re qiang bao cai) that is very popular in Hunan with fried egg and tomato (fanqie chaodan), another basic favourite all across China. Outstanding food and very welcome. There was no running water at the camp-site yet and so we had to use buckets of post rainy season brown lake water. You gotta love camping. 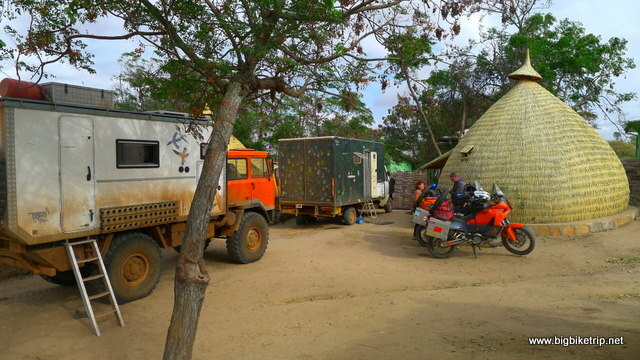 The camp site was really nice and relaxing, but our walkabout to explore the surrounding area was less so. Only about 15 minutes away was a local village. To get there we walked through beautiful fresh countryside, resplendent in flowers and greenery and then into the town that was squalid and smelly. What a contrast. The afternoon walk got even more unpleasant as we were aggressively evicted from a lakeside marine workshop that we accidentally strayed into only to then run into the village mortuary which was basically dead bodies wrapped in cloth by the side of the roadside. Nice. Fanny did not think much of this and literally ran away and so we hurriedly made our way back through the squalid village with all its little kids pestering us back to our little paradise. 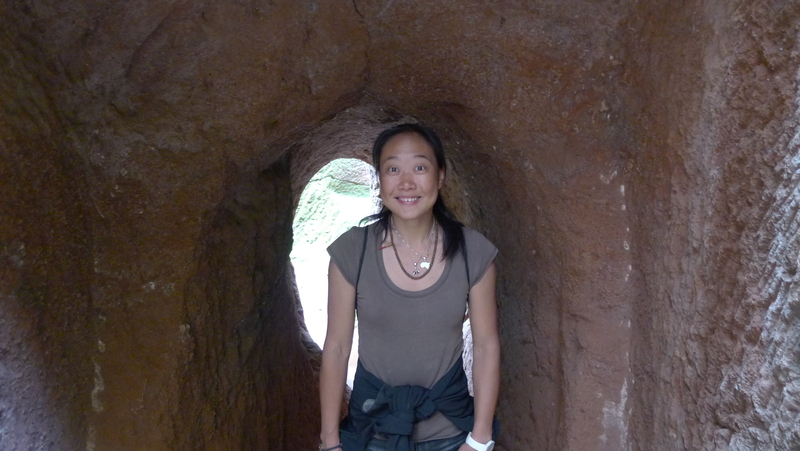 The joys of adventure travel, warts and all. I decided to do some bike repairs at LakeTana and whilst attempting to straighten the pannier frames by leaning Fanny’s bike against a rock the bike suddenly slipped and fell on top of me and I couldn’t get it off. Fanny, the world’s expert on lifting up KTM 990 Adventures came to my rescue, lifted it back up and then recoiled shouting, ‘EEER, YUCK ER XIN’. I looked down at my leg and it was slightly bleeding. On closer inspection after wiping away the blood I saw that there was a inch square hole in my shin down to the bone. Worse, when I looked at my foot-peg a small lump of me was wedged in the metal serrations. Barf! It did not hurt too much but it needed cleaning, disinfecting and wrapping up quickly as it started bleeding quite persistently and the place we were in was ground zero for infections. Fortunately, we had gone to great efforts to pack a very well stocked first aid kit, and I quickly sorted out the flesh wound as Fanny was grimacing from a safe distance. As the 200 + kilogram bike fell on top of me the serrated foot-peg had gouged out a size able piece of flesh from my shin which was now firmly wedged into the metal work. This left me with the rather disgusting task of working out how to dispose of it. One of the dogs was looking longingly at me and at the lump of flesh and it didn’t seem right to be eaten by Bonzo and so I loaded the slimy lump of Rupert flesh into my catapult and fired it into the lake for a sea burial. Later the wound would be further picked away at by coral fish while snorkeling in the Red Sea in Egypt. How nice …fish food. 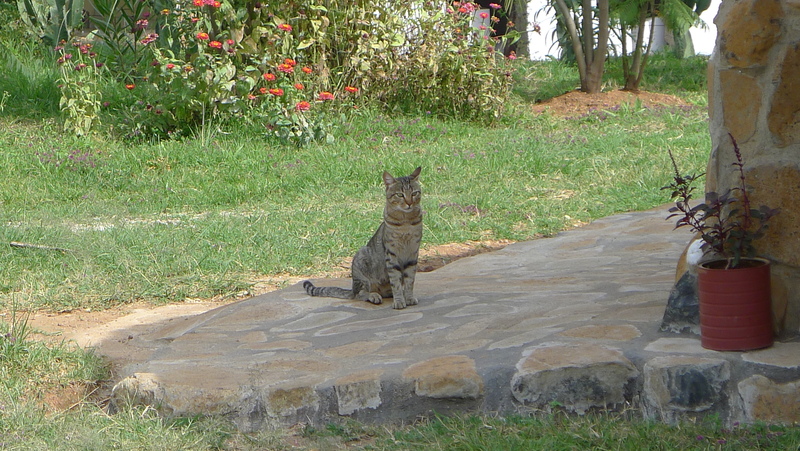 Because of the ridiculously short length of stay on our Ethiopian visas we had to press on towards Sudan. 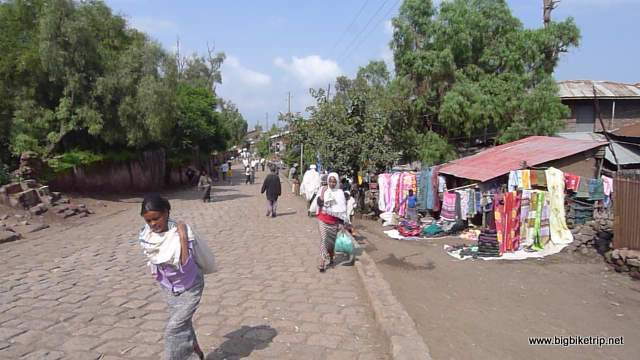 We decided to stay in Gonder for a night as the town looked quite nice and we thought we should stock up on supplies for Sudan, which we had been told was short on food and water, scorchingly hot and very remote. 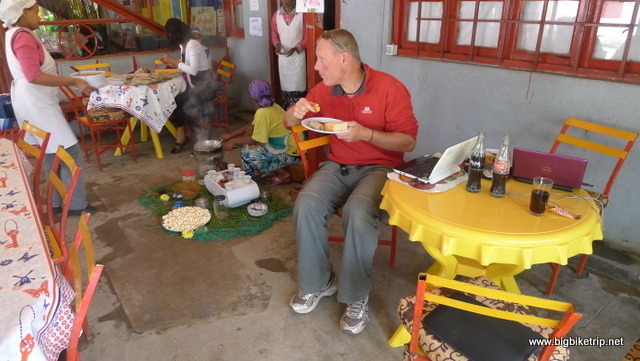 After finding a decent and cheap hotel in Gonder we went out to find something to eat and buy some supplies for bush camping in Sudan. We also had to get some cash as we were told there were no ATMs in Sudan either, advice that turned out to be inaccurate on both counts. What shall we have to eat? Tibis. Hurray we love tibis. Unfortunately the meal, which we ate at a rather nice rooftop restaurant, immediately went through the system like an ice cube does in a bar in Delhi. Its so often the case that nice looking places are less hygienic than basic lu bian tan (street side stalls). Maybe it was one of those road kill goats that got catapulted into the air by a bus, or perhaps it was just reheated leftovers.. who knows… but whatever it was or contained it was not staying inside Rupert Utley. It is never the easiest task to find a bog in an emergency, but as an experienced traveler I know one should head to the poshest hotel one can see, and walk as confidently and purposefully across the lobby ….as anyone can with clenched buttocks… to the target loo without eye contact with anyone. Make it look as if you belong. Also, I suggest you go Muslim if you can. The water jet not only cools the bum, but you can hose down the walls and ceilings at the same time. This blog is full of useful hints and advice. My next task was more important. Chelsea were playing Manchester United that afternoon and I needed to find a bar or hotel that was showing the game. My inquiries with the local street urchins, who always seemed to have the best “intel”, came up consistently with the same answer. The cinema. 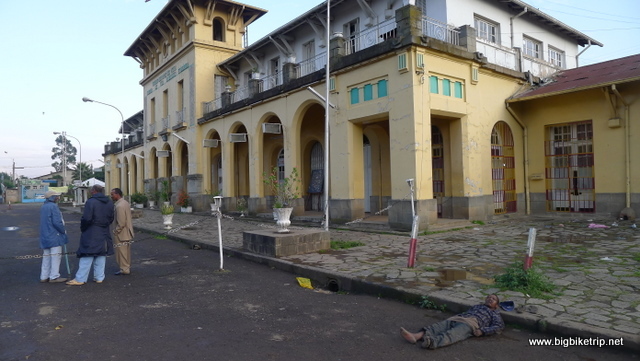 Indeed the cinema right in the middle of the town square was the right place to be on football day in Gonder and I bought my ticket for the equivalent of ten pence and joined a queue of far too many people wearing red. In fact, I think as a Chelsea supporter, I was in a minority of about 0.05% and we were all squeezed into a huge old style cinema. I never got a seat, far too slow and polite to barge and so I leaned against the door throughout the game. It was noisy before the game even started, but when it did there was chaos, and a near nuclear bomb level cacophony when bloody Man U scored. What? How come Rooney never plays like that for England. To add to the excitement there was a huge fight in the middle of the cinema and the security people, who were actually armed with rifles, were sent in, but sadly the drama ended swiftly without shots fired as everyone soon made friends when Man U scored again … hugging each other, whistling and clapping. Chelsea did manage to score a goal and the “other” Blues supporter, a boy of about ten, got on the stage and performed a very decent little jig and light silhouette show until he was eventually tackled and thrown off to general cheering and applause. Fanny had come in at half time with cold St. George’s beers, but as an Arsenal supporter she had completely jinxed the game. Its all Fanny’s fault. That said it was a lot of fun, despite the undeserved defeat. Early the next day we filled up our 30 liter water bag from the communal tank, adding some preventative drops of water sterilizer to prevent a repeat performance of the trots, carried extra fuel cans, loaded all the fruit, vegetables and noodles we had painstakingly found and purchased and packed up the washing which was still damp from one of Fanny’s “let’s wash everything” campaigns. 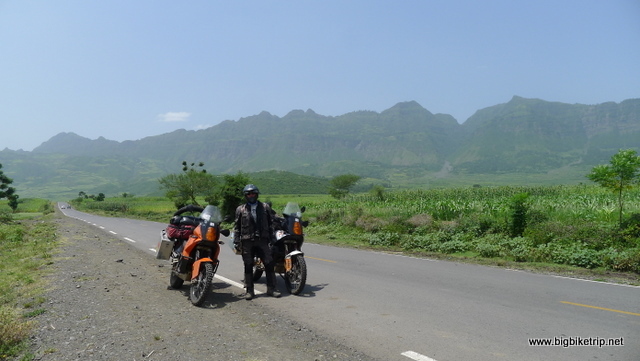 On the way along truly spectacular roads that weaved left and right and up and down through mountain passes and lush green valleys I saw the headlights of two motorcycles heading towards us. I immediately recognised them as belonging to two fully laden adventure motorcycles that had clearly ridden into Ethiopia from the border. 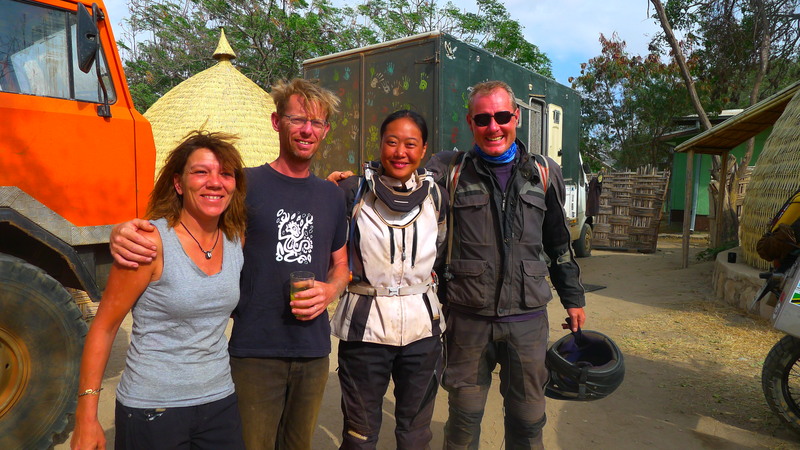 When we reached them we stopped and greeted our fellow adventurers who turned out to be a couple from Germany on mid sized engined Suzuki motorcycles. 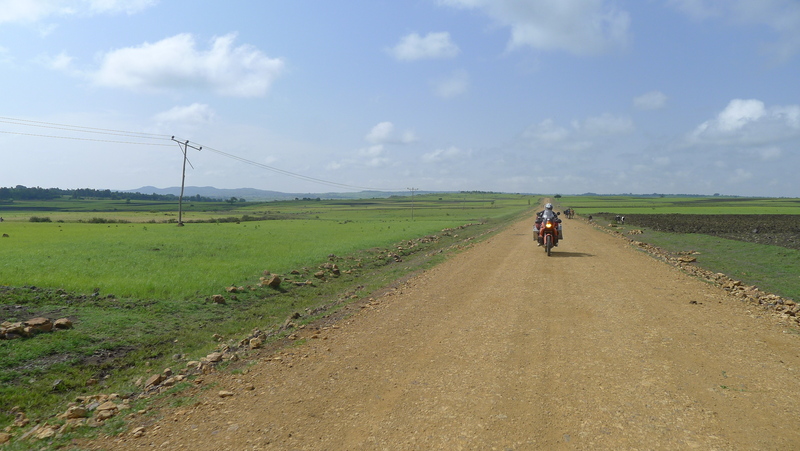 We had not seen these kind of motorcycles on the trip so far, the vast majority of adventure bikes being BMWs. 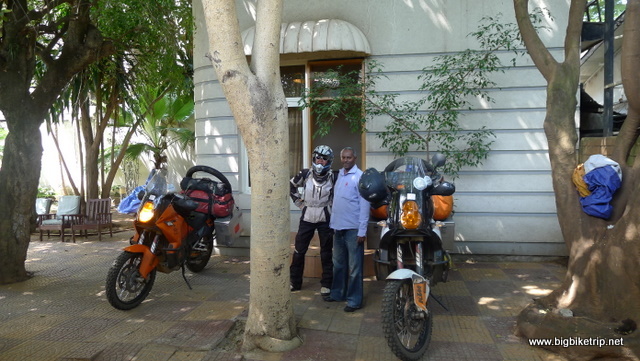 It was nice to meet some riders who had just come from where we were heading and swap notes. It seemed our worries about food and fuel in Sudan were exaggerated, but we were alerted to the fact it was blisteringly hot in Sudan, sometimes reaching up into the late forties. That said we were told it was very easy to free camp in Sudan and that it was a huge country and in places actually very interesting to ride through. This was great news and Fanny and I were now very excited about the prospects of leaving what was essentially known as Black Africa, and into Arab Africa. A little further on when we were taking a break at the side of the road with dozens of local children a Sudanese registered 4×4 pulled up along side us and the very friendly occupants were very enthusiastic about welcoming us to Sudan, gave us their contacts details and offered to help us if we needed anything. This raised our spirits considerably and both of us were very excited about what lay ahead. 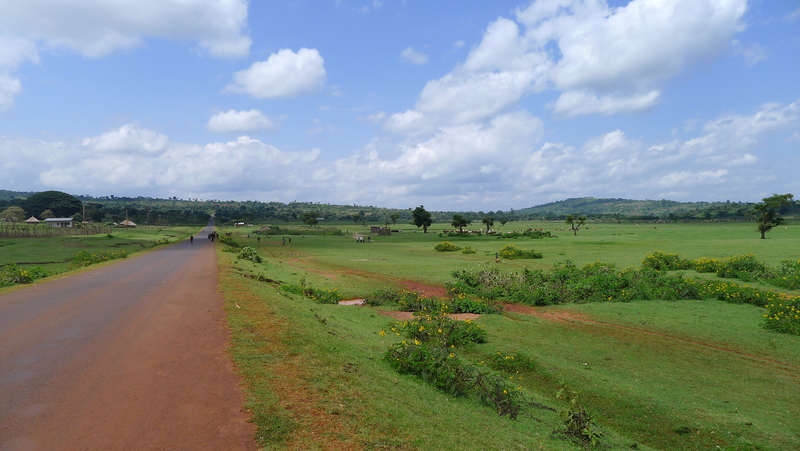 When we eventually got to the border I have to say I was a tad disappointed to see the same green pastures and countryside on the Sudanese side. I was sort of half expecting to immediately see white deserts, mosques, camel trains and Bedouin camps. Of course, all this was to come very soon. 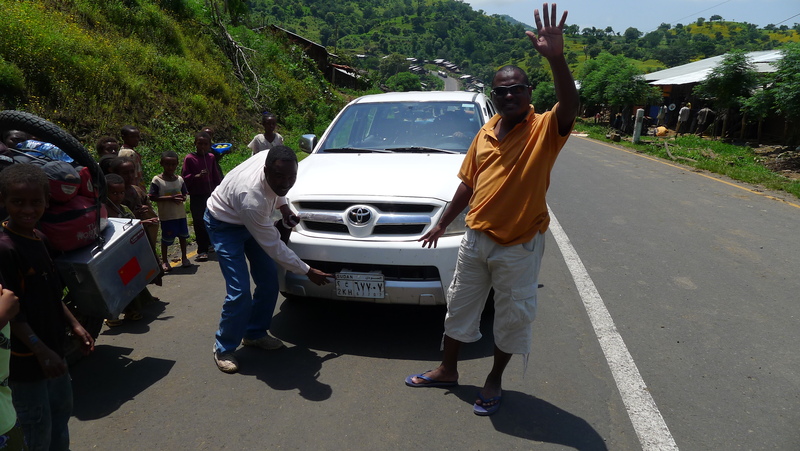 The kind Sudanese guys we met just before the border… pointing to their Sudanese licence plate. 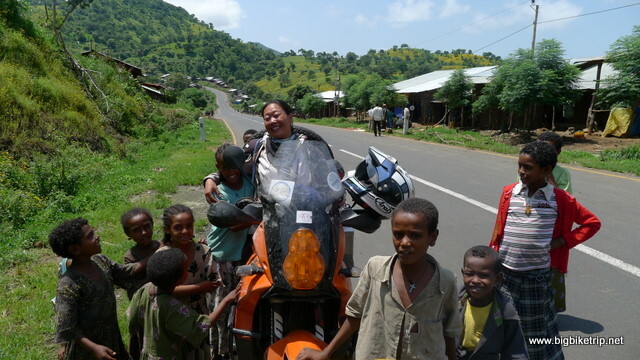 It is always very heart warming to be warmly greeted by complete strangers in far flung places. This has happened to me in the USA, Europe Africa and Asia, but never in the UK. 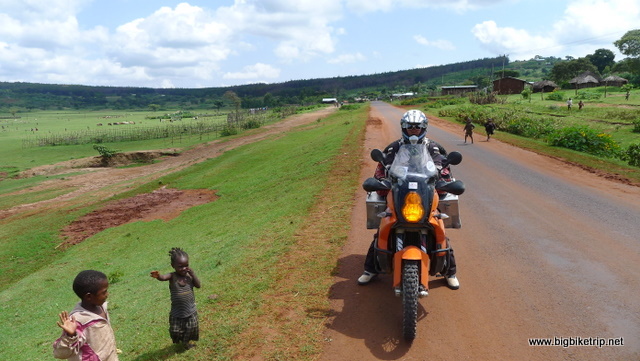 This entry was posted in Africa, Animals, Fanny, KTM, Rupert, Uncategorized. Tagged Addis Ababa, AID, Bob Geldoff, Bono, Ethiopia, Lalibela. The Ethiopia chapter is complete. Sudan is in progress. Comments always welcome. Love it, great stuff. Wish I was there. Wauw, what an adventures ! Love to read about ur trip ! Enjoy guys !! You just make me laugh. 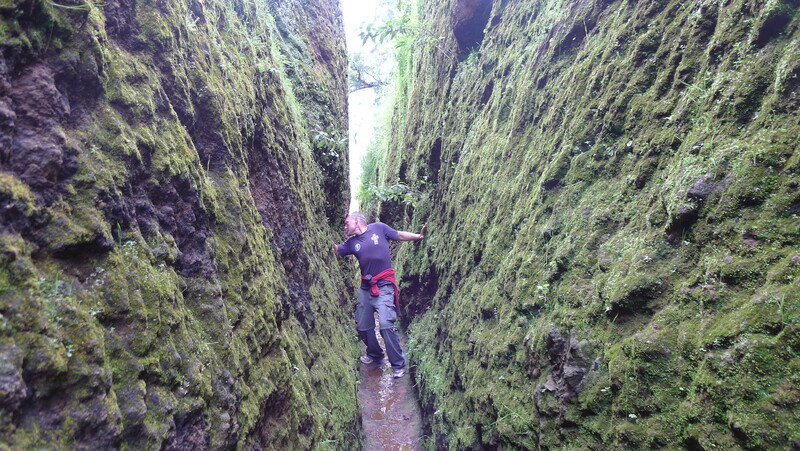 Julie Andrews would have sung….the hills are alive with Ruperts catapult! Good for you, I say.